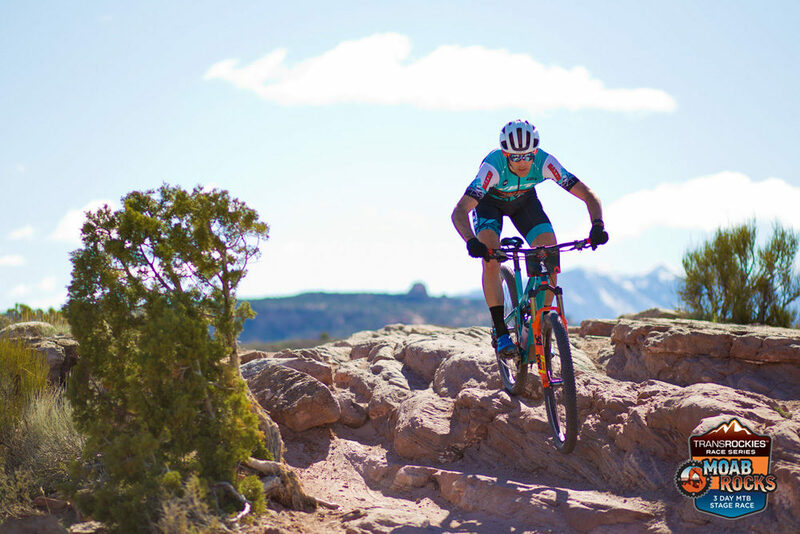 The final stage of Moab rocks is the most popular and it’s no surprise with the mixture of challenging rocky climbs and burly, thrilling descents. The race starts on Gemini bridges road which turns from a flat dirt road to a steep climb in the first mile. The climb helps to spread racers out and once over the top it’s a fast, loose road descent onto a flat road ride until the next steep paved climb. After a few more miles, racers start climbing technical single track but are rewarded with fun descents and some dirt flow sections. The trail continues in an upward trend until Bull Run, a thrilling rocky descent. Next the trail climbs and descends some rocky plateaus before racers head over to great escape for some more downhill fun. Once off the single track it’s back up and over Gemini bridges road to the finish. Today was another beautiful sunny day for racing some challenging, phenomenal singletrack. For the pro men, on the first single track, Geoff Kabush (Yeti) pushed ahead from the lead pack. 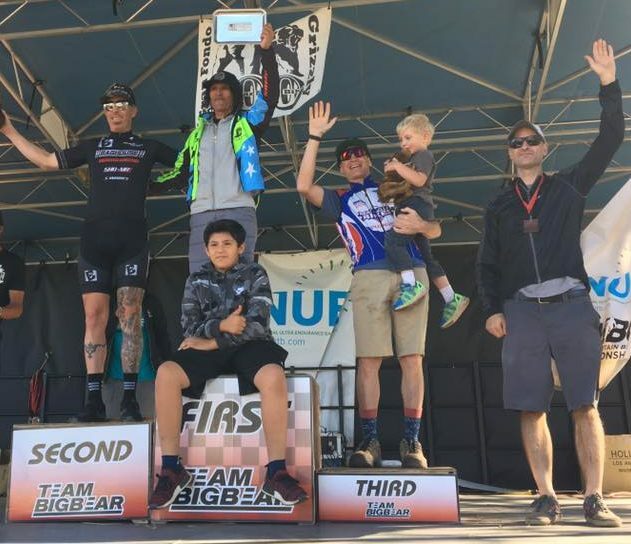 Cal Skilsky (CZ racing), Taylor Lideen (Pivot), and Justin Lindine rode together on the single track but once on the final road section they were caught by Ben Sonntag (Clif Pro Team) and Cooper Wiens (Topeak Ergon). It was a sprint finish to the end for 2nd-6th. Kabush won the stage in a time of 1:57:31. Lindine finished 2nd (1:59:01), followed by Lideen (1:59:02), Skilsky in 4th (1:59:02.5) and Sonntag in 5th (1:59:04.3). For the overall, Kabush wins with a total time of (5:17:50.3), followed by Skilsky in 2nd (5:20:27.2), Lindine in 3rd (5:20:50.2), Sonntag in 4th (5:21:26.1) and Lideen in 5th (5:21:29.2). For the pro women Katerina Nash (Clif Pro Team) started in the lead on the road climb. 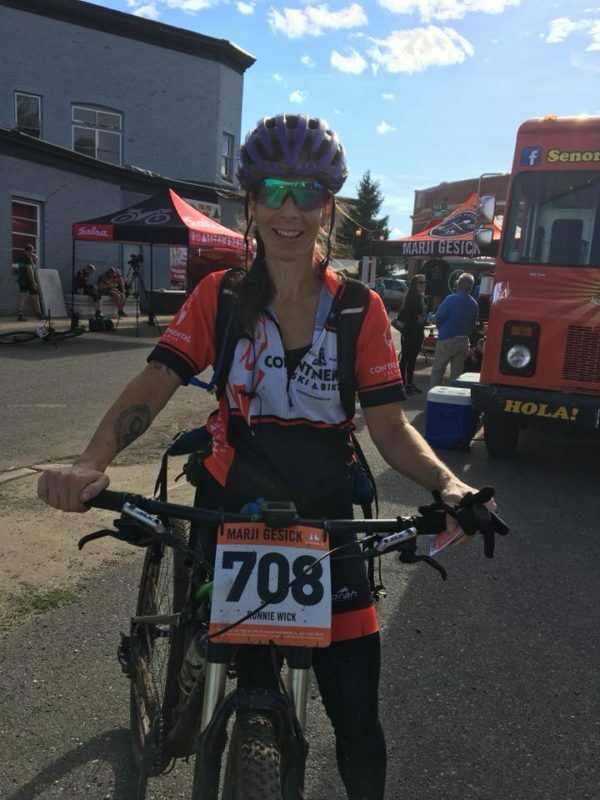 Once over the first climb and on the flat road, Karen Jarchow (Topeak Ergon) worked with a group of men to catch her but when they reached the single track, Nash took off. 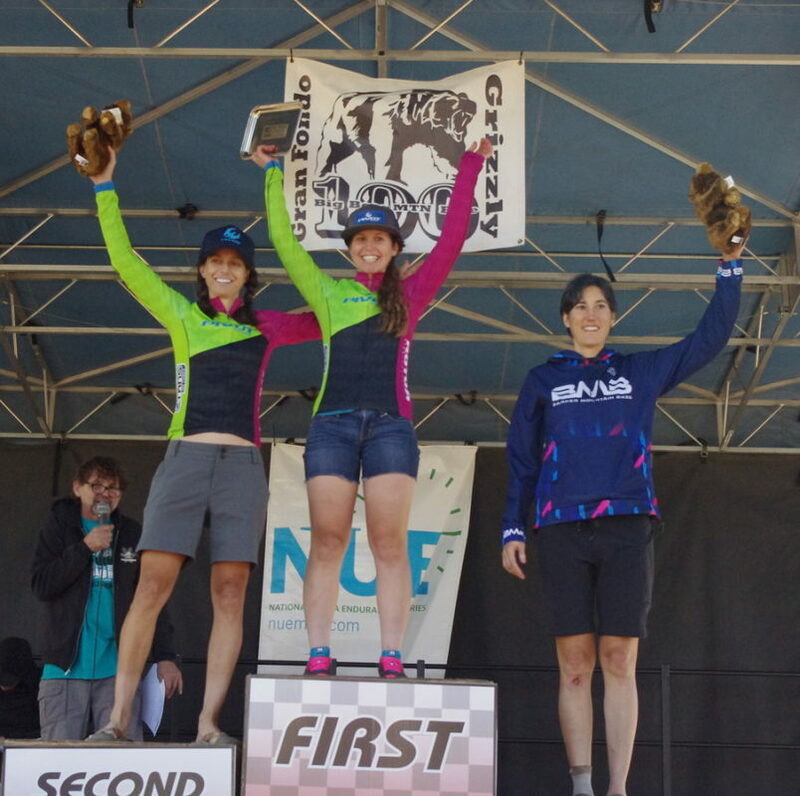 Marlee Dixon (Pivot/ Pearl Izumi) raced in 3rd until Bull Run where she ran into chain issues and was caught and passed by Tamara Donelson (The Cycle Effect). For today’s stage, Nash wins (2:16:02), followed by Jarchow (2:29:48), and Donelson in 3rd (2:30:19). For the overall, Nash wins Moab Rocks with a time of (6:10:05), Jarchow finishes 2nd (6:45:17) and Dixon in 3rd (6:46:32). rider: Justin Lilndine leads Geoff Kabush. 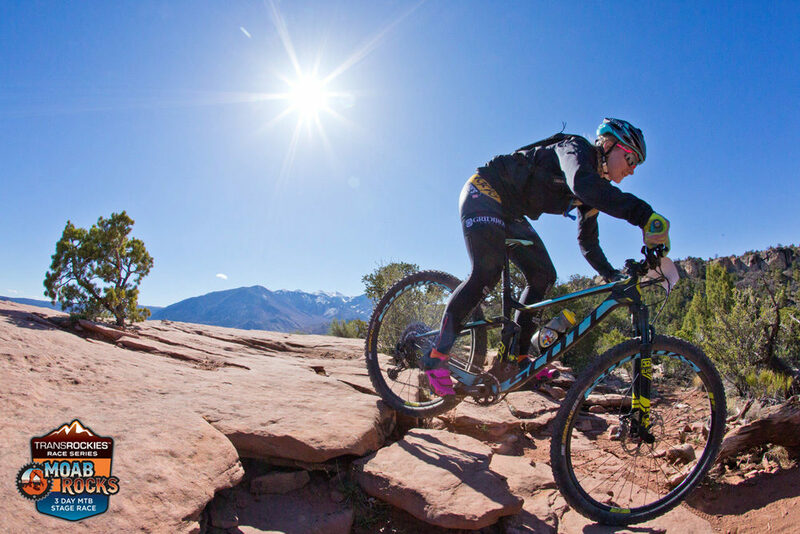 For stage 2 of Moab Rocks, racers head out of town to the Klondike Bluffs trails. Unlike the beautiful sunny skies of yesterday, racers started this morning in overcast, cool conditions. The forecast was for 60’ weather and no precipitation but an hour into the race, big wet snowflakes fell on racers! 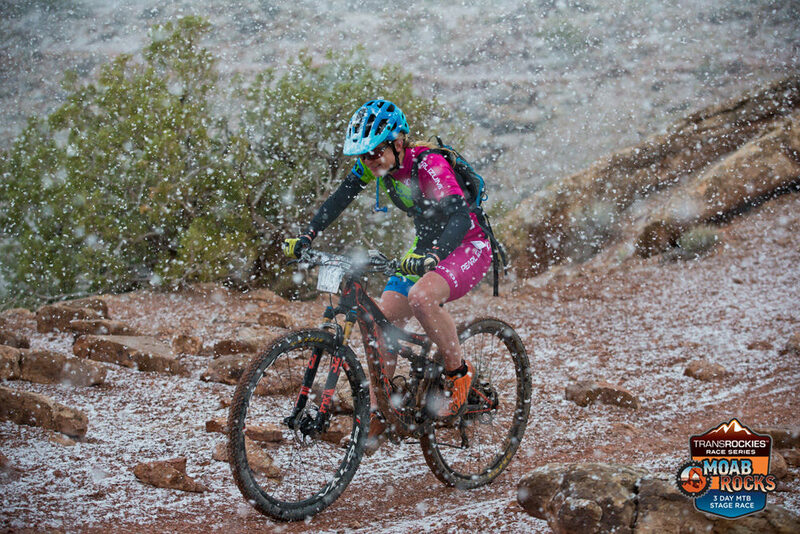 There’s something about crazy weather conditions to add to the epic-ness and challenge of a mountain bike race! At 8:30am, the gun went off and racers charged ahead. The first 5 miles of the race are an undulating road ride where racers quickly spread out. Once on the single track it’s a mixture of slick rock and dirt with technical features and quick climbs/ descents. The snow added a different complexity to the race- with wet rocks, cold temperatures and limited vision. Once the storm had passed, racers again enjoyed sunshine and tacky trails. For the pro men, it’s still a tight race with 2nd-5th in a sprint finish. The top 5 pro men raced together until the 2nd check point when Geoff Kabush (Yeti) attacked, leaving the other 4 guys behind. 2nd through 5th worked together trying to catch Kabush, but couldn’t reel him in. Kabush won the stage in a time of 1:48:56. 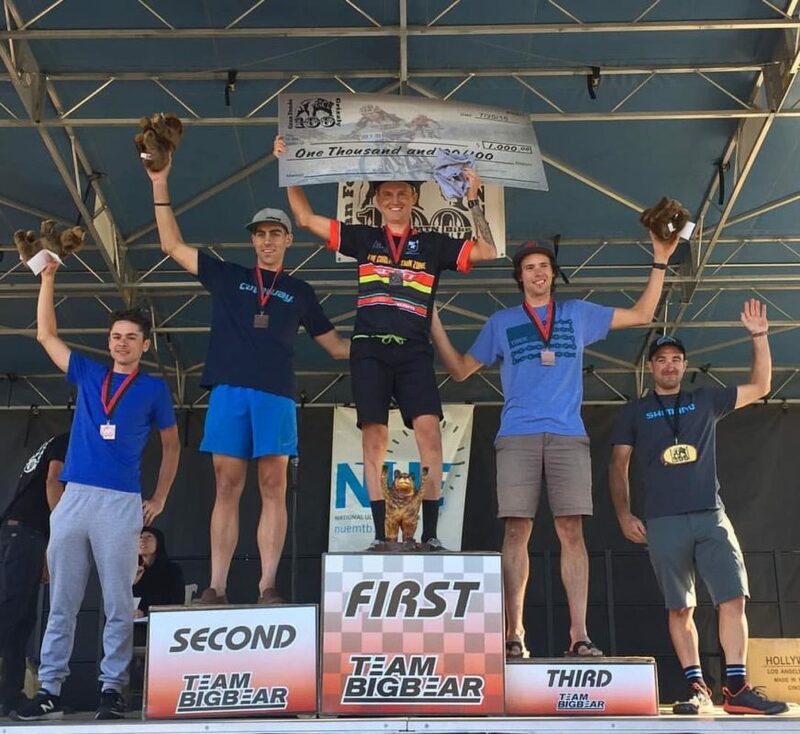 Once off of single track on the last 4×4 dirt road section, it was a sprint finish between 2nd- 5th place with Taylor Lideen (Pivot) finishing 2nd (1:49:20), Cal Skilsky (CZ racing) finishing 3rd (1:49:21) Ben Sonntag (Cliff Pro Team) in 4th (1:49:28) and Justine Lindine in 5th (1:49:29). The overall for men changes today with Kabush still in 1st (3:20:18), Skilsky in 2nd (3:21:25), Lindine in 3rd (3:21:57), Lindeen in 4th (3:22:27) and Sonntag in 5th (3:22:29). For the pro women, Karen Jarchow (Topeak Ergon) lead the women on the road until Katerina Nash (Cliff Pro Team) passed her before entering the trail system. Jarchow kept Nash in sight for the first climb but Nash continued to pull ahead finishing 1st (2:10:23). 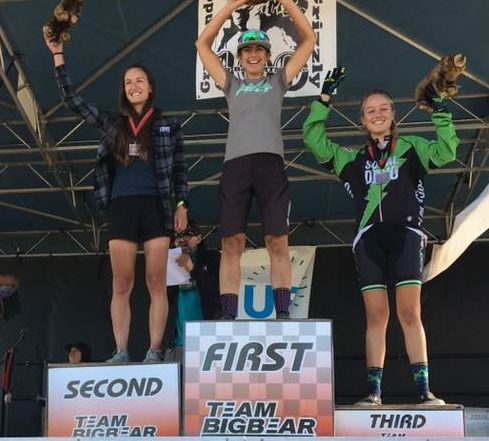 Karen remained in 2nd (2:20:51) and it was a sprint finish for 3rd with Syd Schultz (Jamis Bikes/ Pearl Izumi) finishing (2:24:00) ahead of Marlee Dixon (Pivot/ Pearl Izumi) (2:24:04). For the overall, Nash increases her overall lead with a total time of 3:54:03, followed by Jarchow in 2nd (4:15:28) and Dixon in 3rd (4:15:34). rider: Katerina Nash won Stage 2 in the Open Women category. 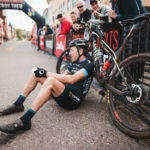 Today’s stage began in downtown Moab, UT where racers lined up in the race corral as TransRockies ritualistic playing of “Highway to Hell” blasted over the speakers. At 8:30am the race rolled out behind a neutral start car. Once on Sand Flats road, the pace car stopped and the race began. The first 13 miles of the race are a steady climb up Sand Flats road with a steep paved section. 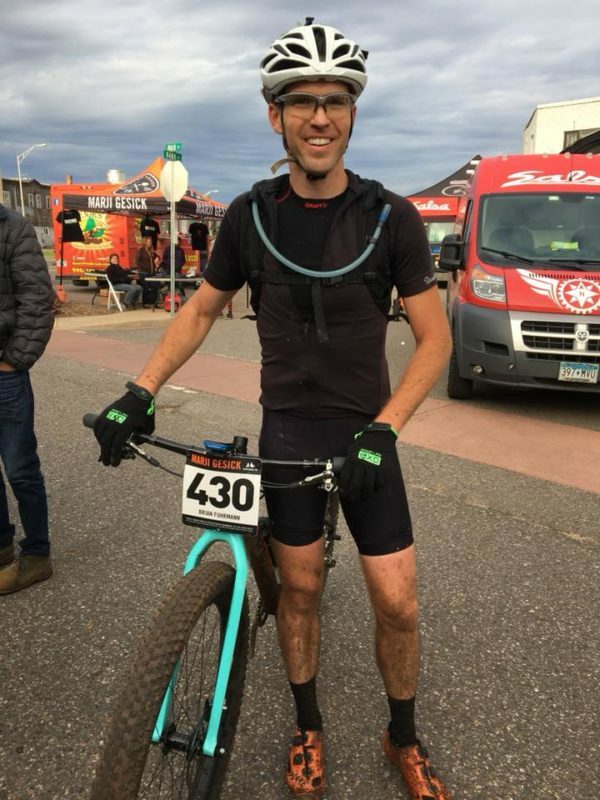 This year, due to excessive snow up high, the course was modified and racers climbed 2 miles less, taking Lazy Man 4×4 trail to Porcupine Rim. Lazy Man is a rugged climb, but once over, racers get to enjoy the legendary Porcupine Rim descent. 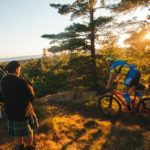 The views from Porcupine Rim are iconic, however, not many racers are able to raise their heads from the fast, technical descent to enjoy the scenery. 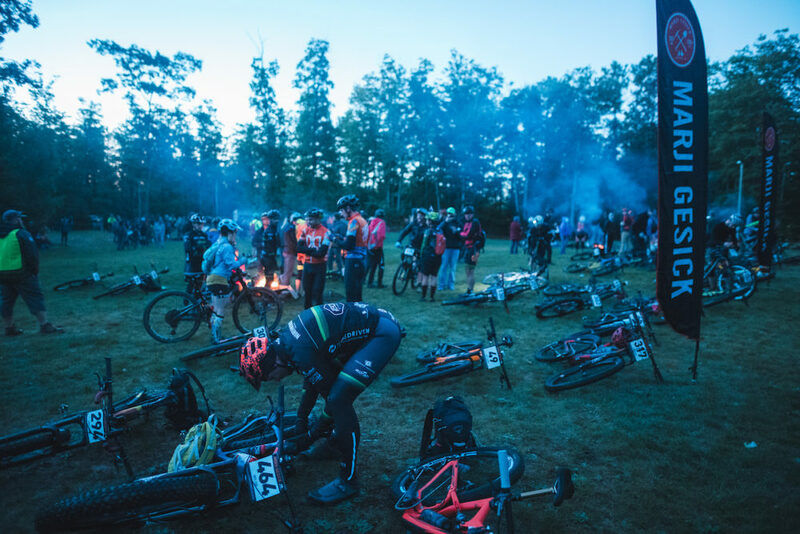 After miles and miles of epic descending, the race ends on Porcupine Rim. Although a cold morning, temps warmed up for a perfect, sunny race day. For the pro women, Katerina Nash (Cliff Pro team) lead the women out, putting distance between herself and the other women on the long road climb. Behind her was Karen Jarchow (Topeak Ergon) followed by Marlee Dixon (Pivot / Pearl Izumi) riding with Suzie Synder (Cannondale). Synder and Dixon caught Jarchow on the road and a mile before the lazy man cut off, Dixon pulled ahead. Nash remained 1st for the entire race, finishing in a time of 1:43:39. Dixon finished 2nd (1:51:29) and Jarchow passed Synder on Porcupine Rim, finishing 3rd (1:54:37). For the pro men it was a close race! The lead group of 20 men rode together on Sand Flats road until the steep paved section, located a mile before the Lazy Man cut off. Once on the pavement, Geoff Kabush (Yeti) attacked, pushing ahead of the pack. Following with him were Cal Skilsky (CZ Racing), Taylor Lideen (Pivot) and Nick Gould. On Lazy Man, Rotem Ishay passed Gould and Lideen followed by Justine Lindine, Cooper Wiens (Topeak Ergon) and Ben Sonntag (Cliff Pro Team). Kabush won the stage (1:31:22) followed by Skilsky (1:32:04) and Lindine (1:32:27). Only 2 minutes separate the top 8 men! With such a close race, a lot can happen over the next 2 days. 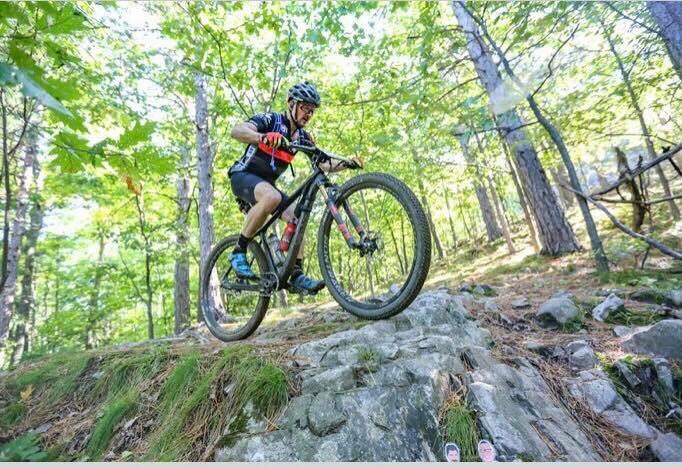 Tomorrow racers head to Klondike Bluffs trails for a very different style of racing including technical, steep xc style terrain. 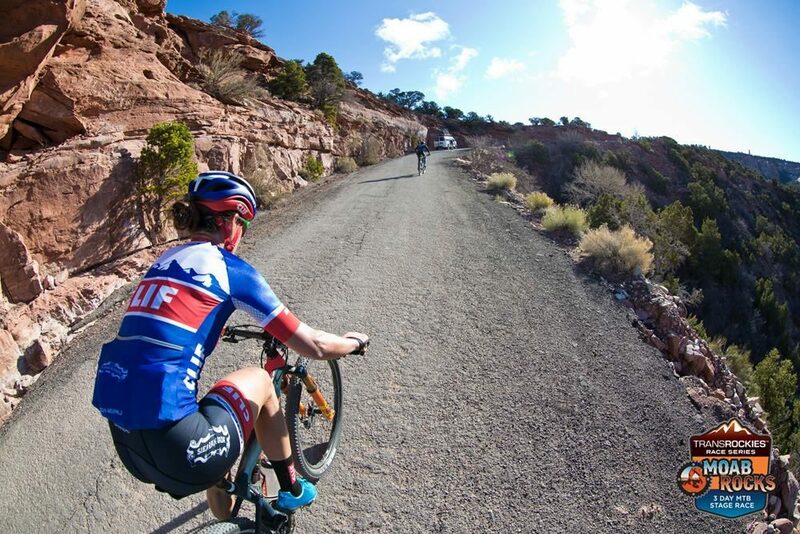 Check back to see how things change up after tomorrow, day 2, of the Moab Rocks stage race. 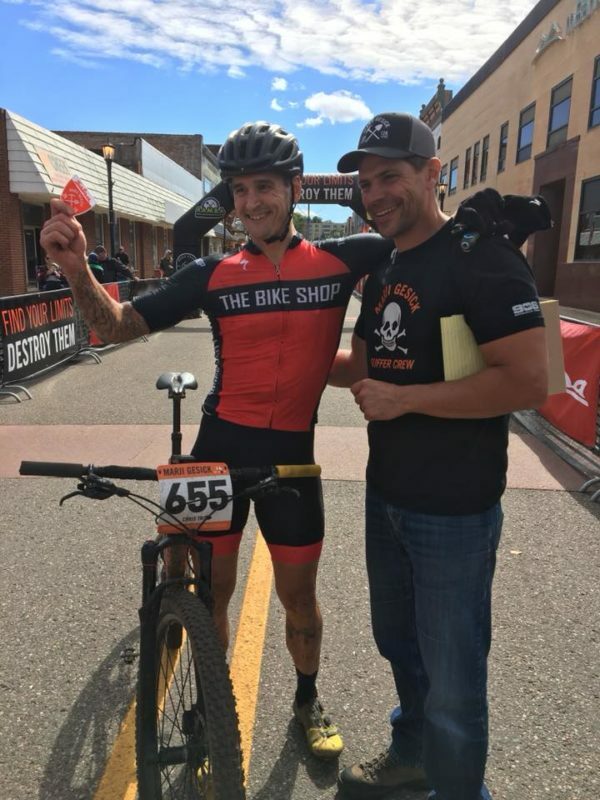 Geoff Kabush wins Stage 1 of Moab Rocks. 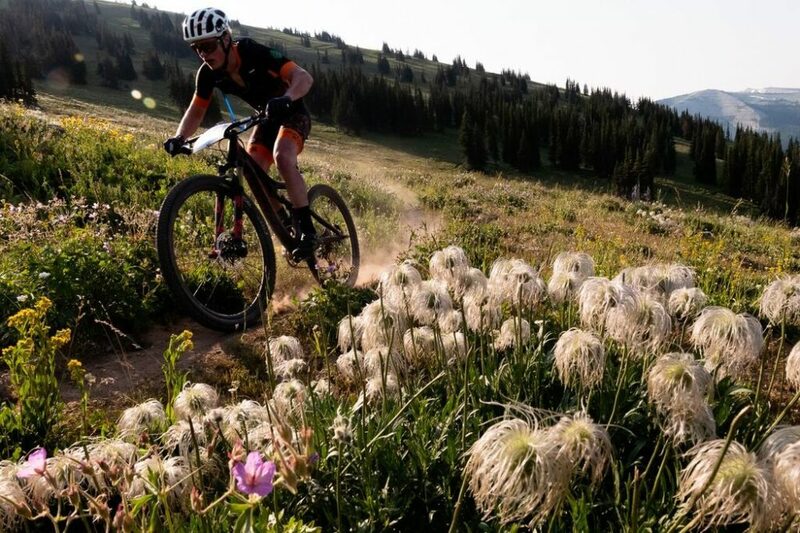 Are you looking for races to kick start your mountain biking season? 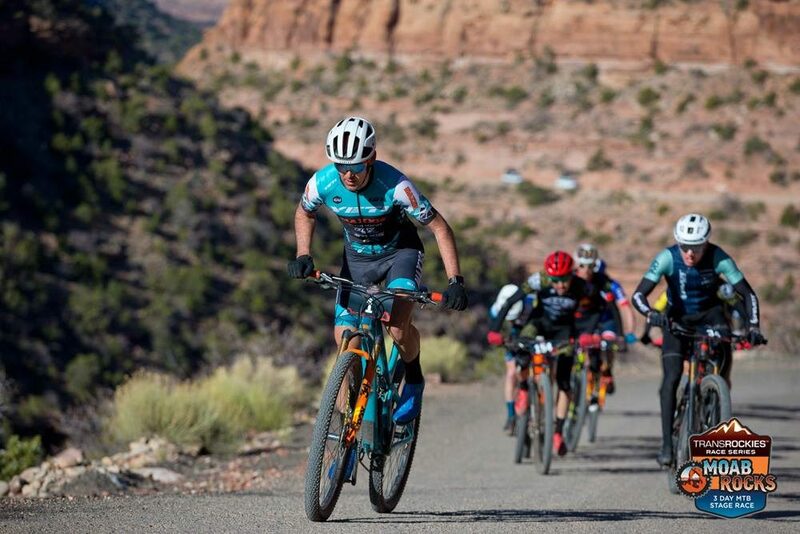 Moab Rocks 3 day XC stage race is the perfect start to 2019! 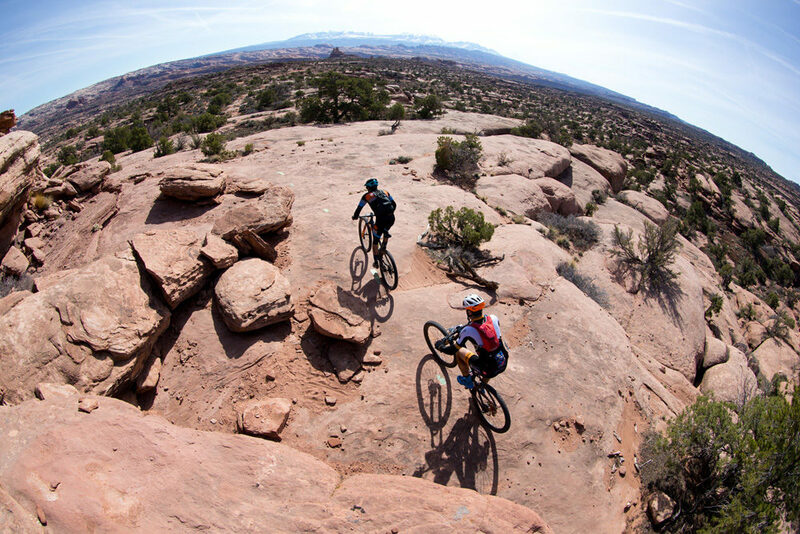 Long known as one of the world’s most iconic mountain biking destinations, Moab features fun, technical desert riding. 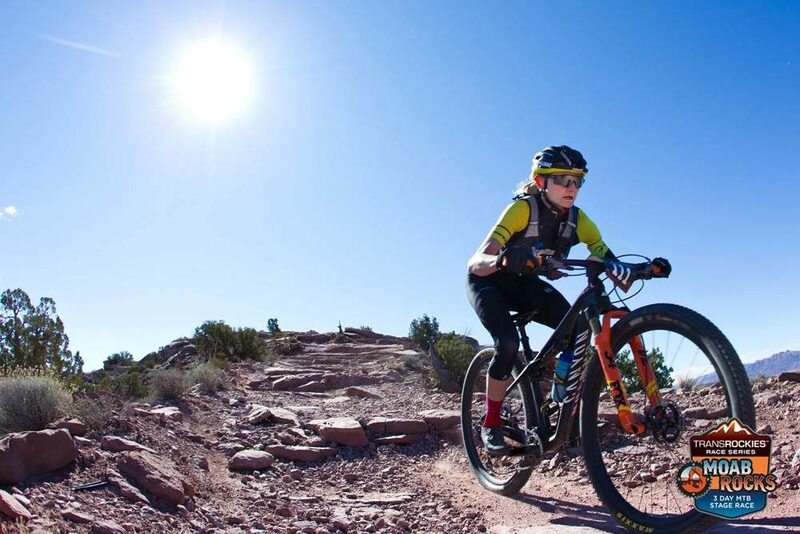 If you’ve never been to Moab before, this is the perfect opportunity to ride some of the best trails in the area including Mag 7, Porcupine Rim and Klondike Bluff. 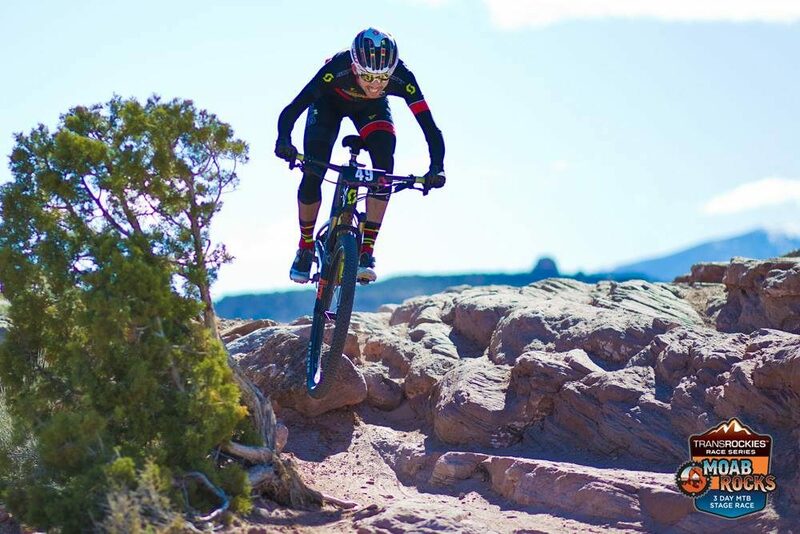 If you have ridden in Moab, then you know you’re in for some of the best mountain bike riding in the country. All this wrapped up in a fun and friendly atmosphere, combining camaraderie and competition. 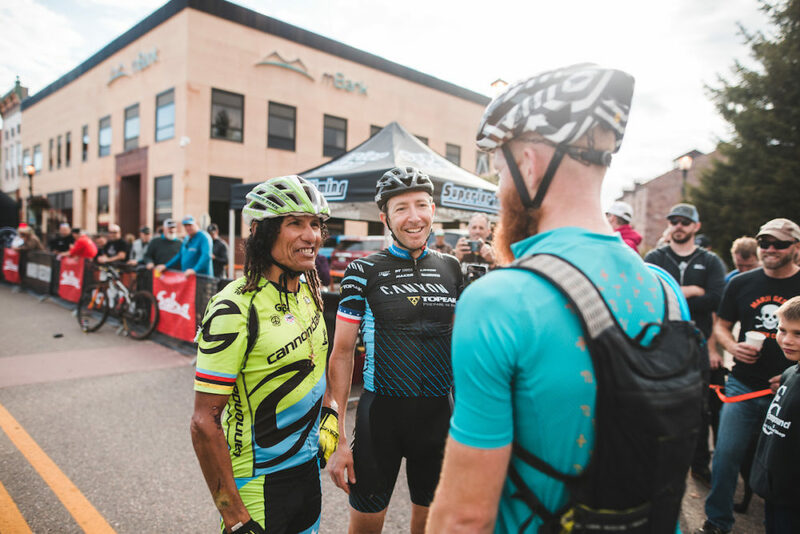 Day 1: Starting in downtown Moab, Utah, racers will line up and head out of town amongst crowds of onlookers. The first 10 miles is a climb up Sand Flats road – perfect for the climbing legs, this is your opportunity to push yourself and get into position for the downhill. 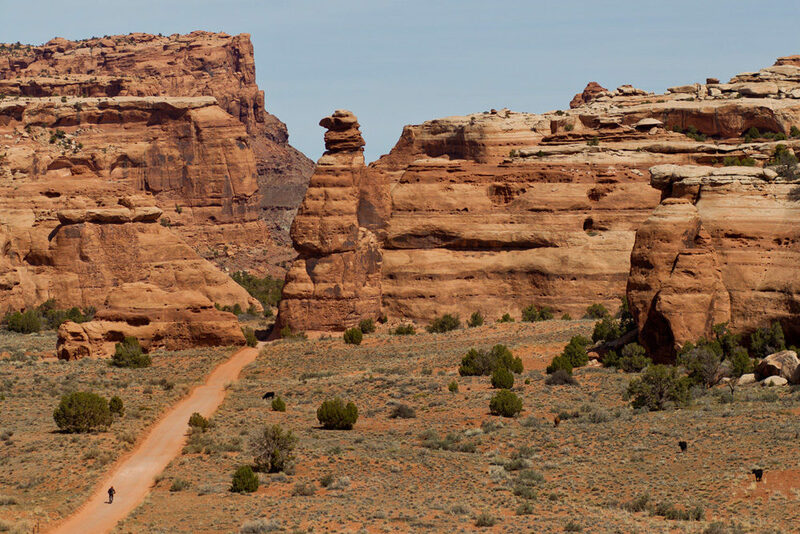 Once at the top of the road, it’s left onto one of the most famous Moab trails. 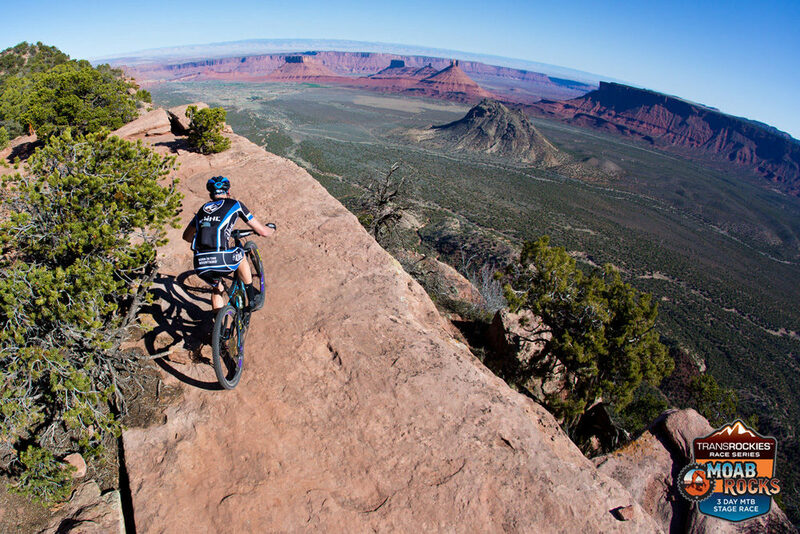 Porcupine rim is an extremely challenging and technical downhill trail that will leave you grinning from ear to ear. 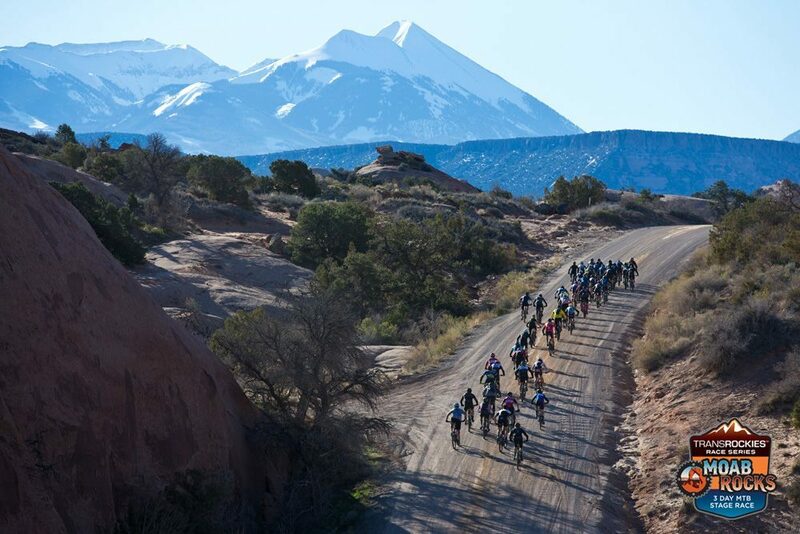 With over 12 miles of descending, you’ll finish day one having fallen in love with Moab. Day 2: After an epic day one, day two is a true cross country race. 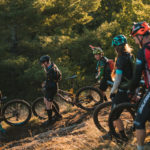 Klondike Bluffs trail system features punchy short ascents and descents, rock features, and moderately technical riding. 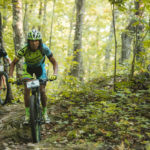 Today’s course will keep you sharp with plenty of technical single track racing. 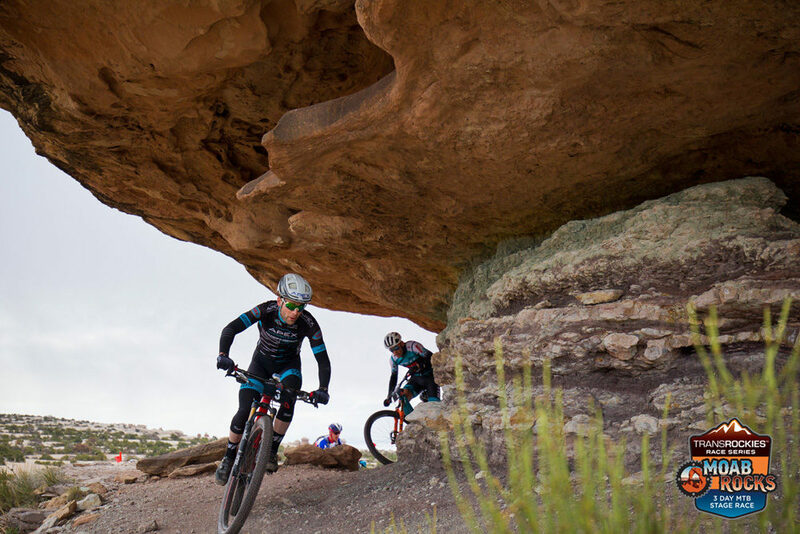 Day 3: After two days of racing, there’s no letting up on the last day of Moab Rocks. Today is your opportunity to race hard and finish strong. 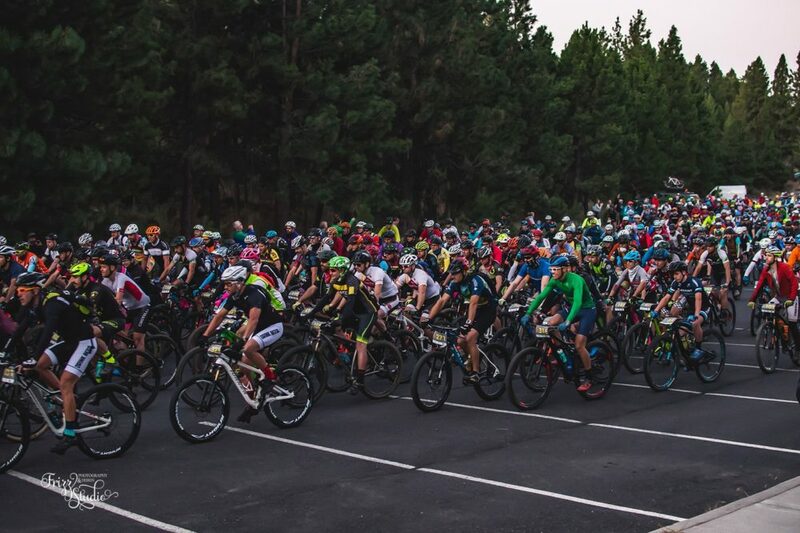 Starting at Gemini Bridges road, today racers begin with a 4 wheel drive dirt road climb followed by a short dirt road descent and then everyone is hammering again on the next road climb before getting onto the single track. 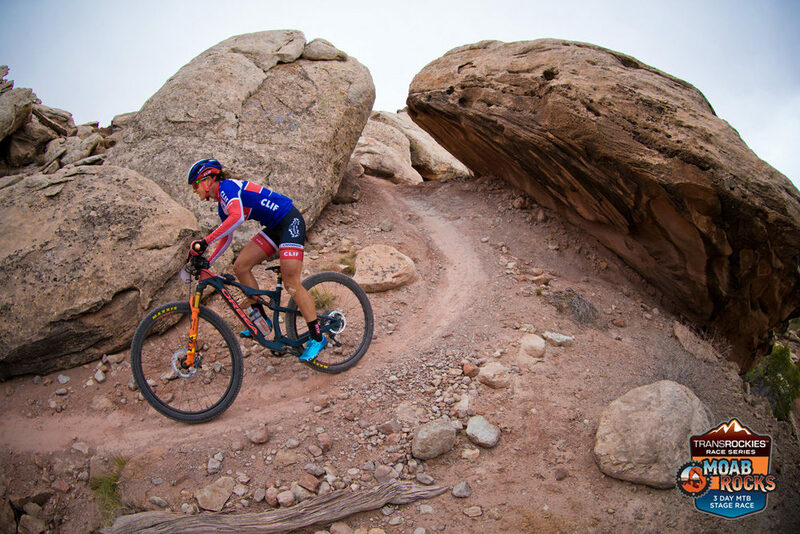 Once on the single track racers continue in an upward trend on moderately technical trails. Finally over the climbing, it’s yet another epic descent on Bull Run. 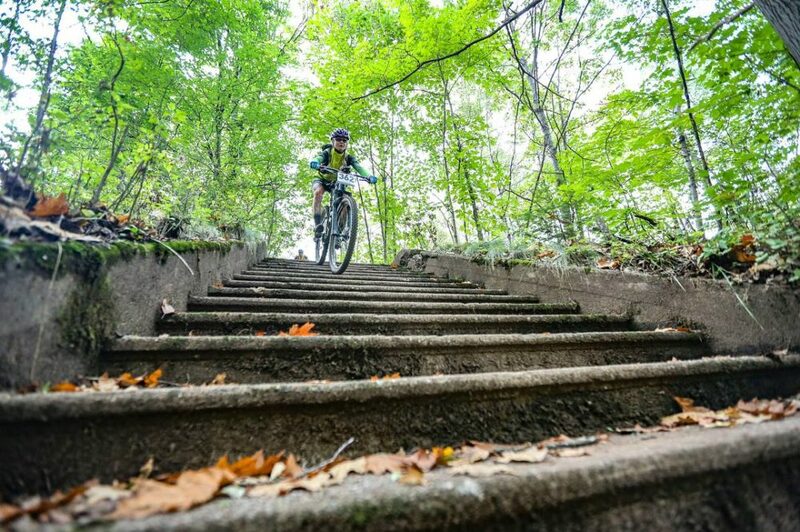 Physical and technical, this descent will again leave you grinning. But leave some in the tank, as there’s still some uphill before you’re home. Racers finish by climbing back up the Gemini bridges road and descending back to the start. 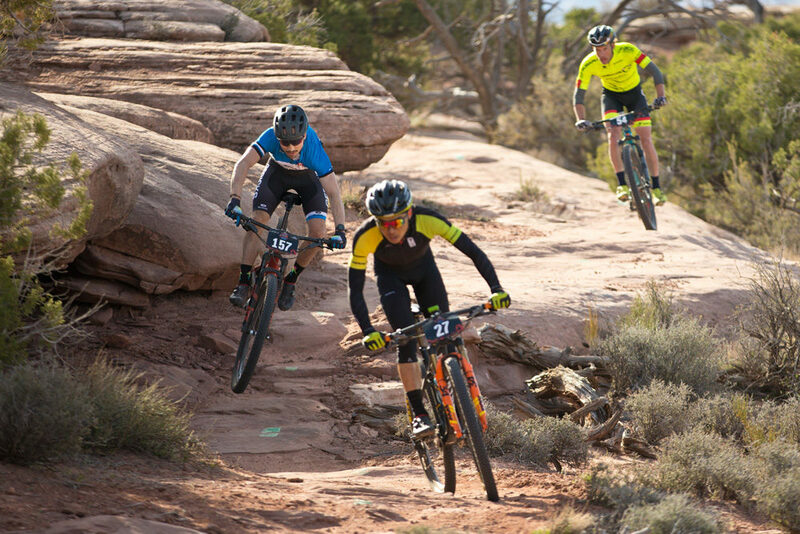 Get ready to push yourself to the limit against pros and amateurs with 3 days of XC racing in beautiful Moab, Utah. Then prepare to relax in the warm desert afternoons, soaking up the sun and experiencing the best in Moab culture, with beer from Moab Brewery, nightly slideshows and awards. For more information and to register visit: transrockies.com/moab-rocks. 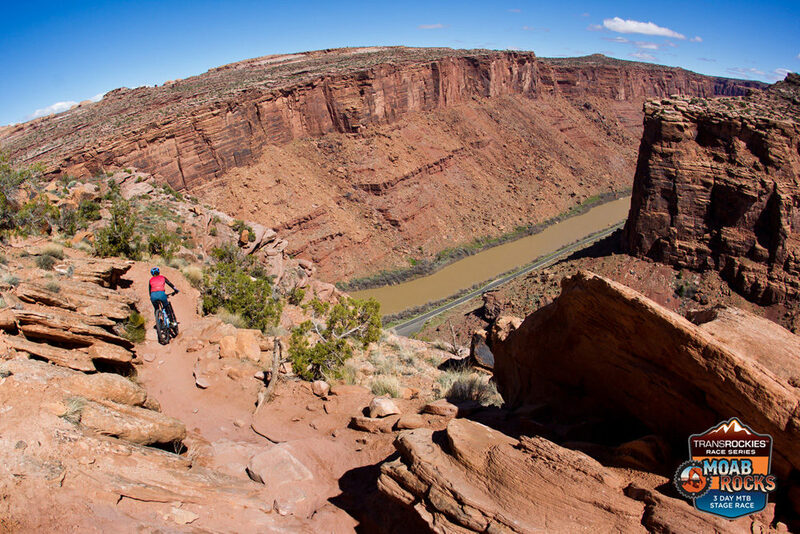 Giddy up and get ready to ride Moab! 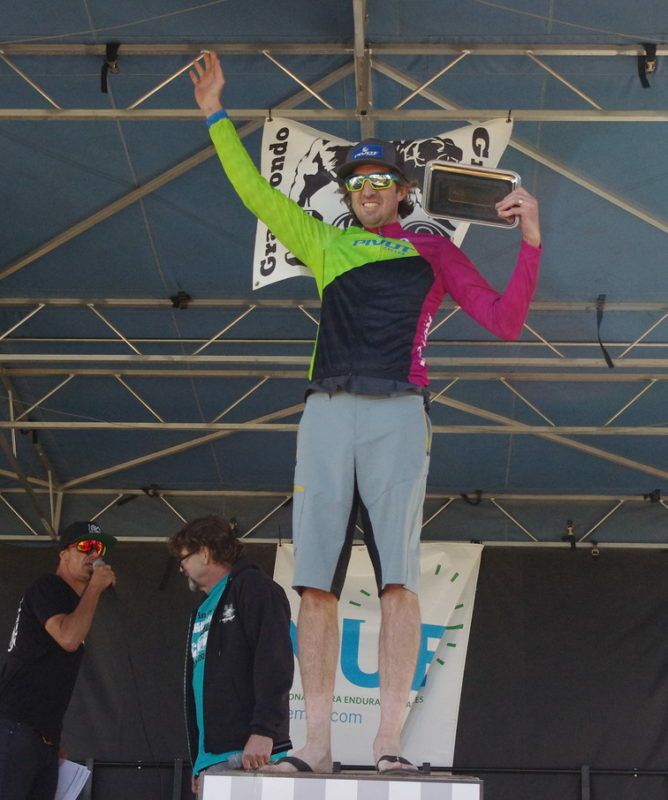 It was Tinker Juarez of Cannondale/LA mirada who took the win in the Men’s Open with a time of 3:34:13. Just about fifteen minutes back was Ty Kady finishing in second with a time of 3:49:09. Rounding out the Men’s Open podium was, Romolo Forcino, finishing third at 3:52:48. “The 75 k starts out with a climb that takes approximately 20 minutes and then enters the long technical downhill of the 7 Oak Trail. I entered the 7 Oak Trail in second place about a minute or two down on Tinker Juarez. After the long descent there is a long gradual dirt road climb to the top of the Santa Ana River trail. Ty Kady passed me just before entering the SART and I rode alone until I reached the infamous Radford Road climb. During the hour long Radford Road climb, I came close to reaching Ty in second place, but I was not able to completely close the gap. 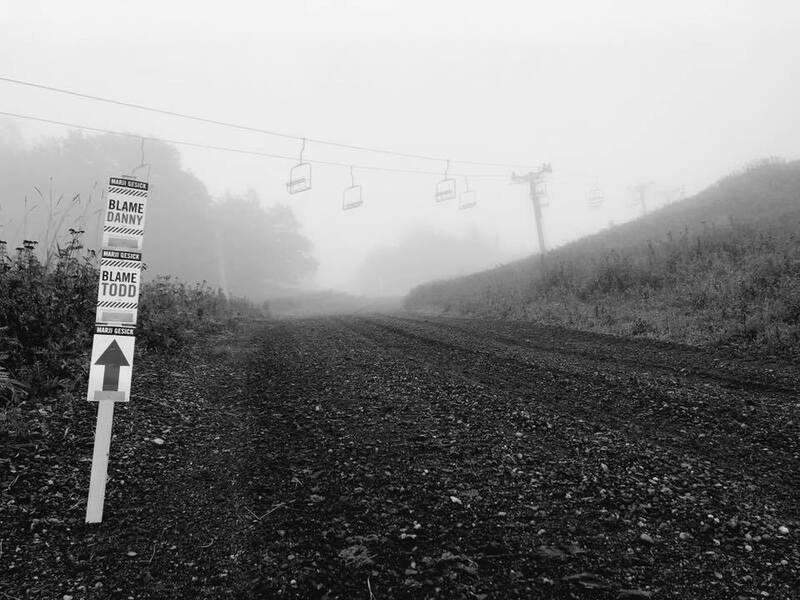 At the top of Radford, I rode alone on the Skyline single track to the finish of the race. It all came down to the Grizzly 75K to determine the NUE women’s marathon series winner for 2018. 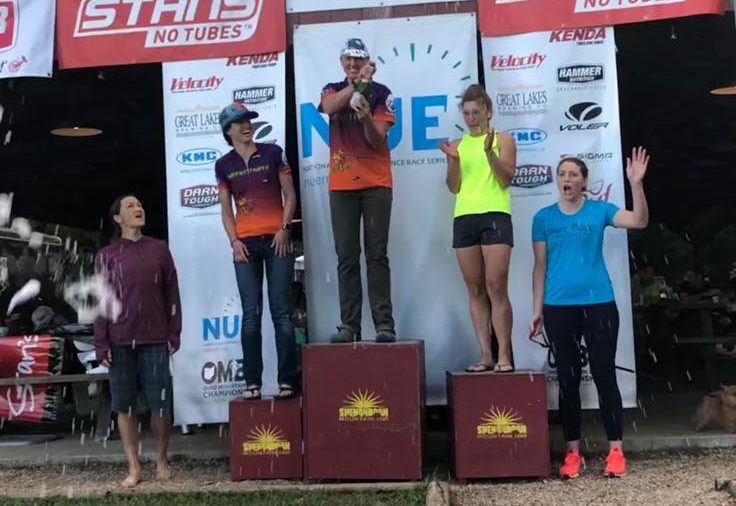 Taking the win with a time of 4:46:15, Jen Toops of Pearl Izumi/Pivot Cycles MTB, 2017 NUE marathon series champion, successfully defends the 2018 NUE women’s marathon title. ” This was a big race for me. My husband and I came early and pre-road the singletrack sections. I chose to ride my Pivot Les with all the climbing. If I wanted to defend the series I had to have a strong smart race. The race started fast. 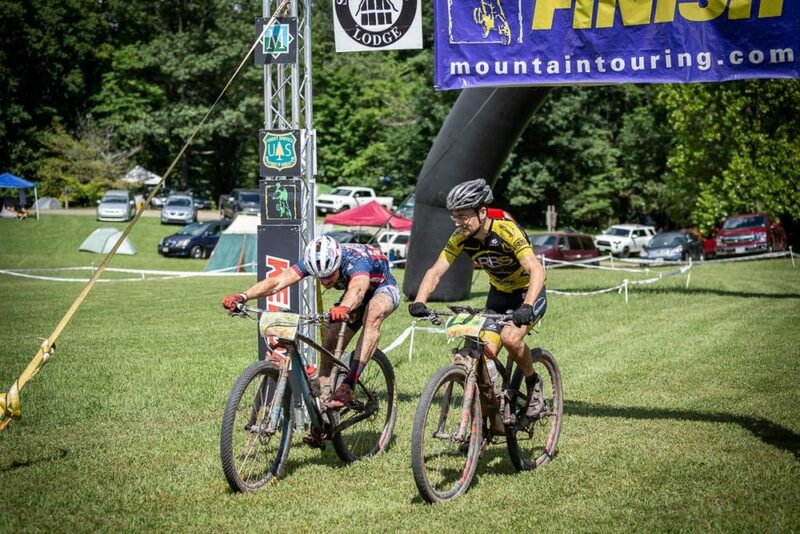 Blanchard, Jen Hanks and I were all neck and neck on the first climb fighting for position. 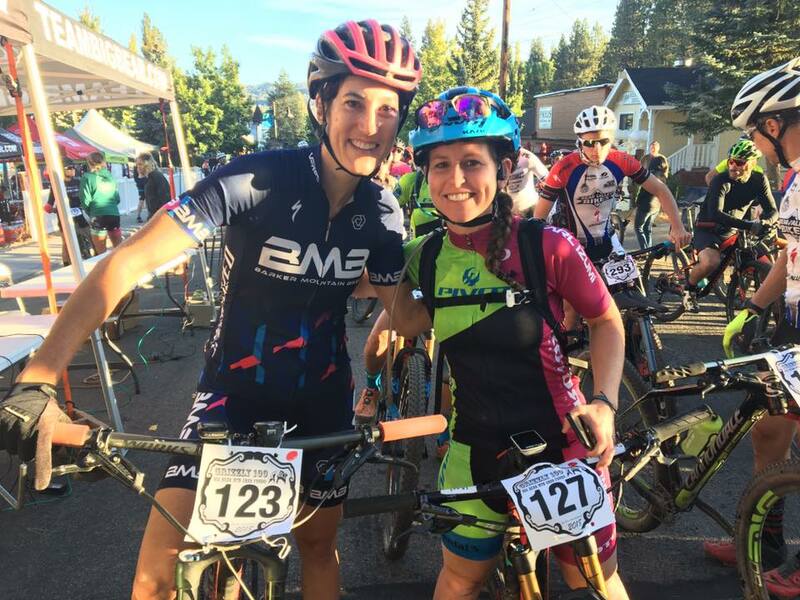 My teammate, Jen Hanks, and I made some time on Blanchard on the first super loose downhill and eventually lost sight of her. Hanks pulled away on the first flat dirt road section and I lost sight of her. I was feeling good on the singletrack and then I hit my handlebar on a tree bombing a downhill. Boom, I was thrown on my back landing on my pack and sliding into a rock that luckily prevented me from sliding down the mountain. Another racer helped me up, made sure I was ok and sent me on my way. My levers were all out of place and I a little shaken up but I had to focus. Then came the Radford climb. I knew Blanchard was strong on long climbs. I gave it everything I had. By the top of the climb I could see Hanks but surprisingly never saw Blanchard behind me. 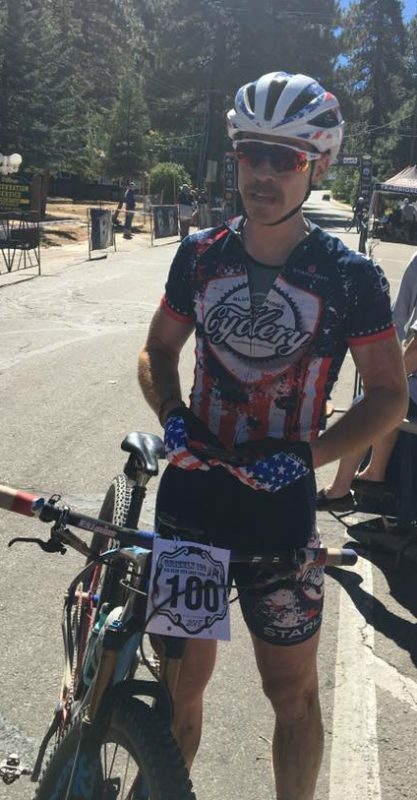 I had pre-rode the last singletrack section, the skyline trail, and knew what was left in the race. Catching Hanks in the singletrack we exchanged words of encouragement and we pushed to the finish claiming first and second! Just over two minutes back was, Jen Hanks of Pearl Izumi/Pivot Cycles MTB finishing strong at 4:49:00. 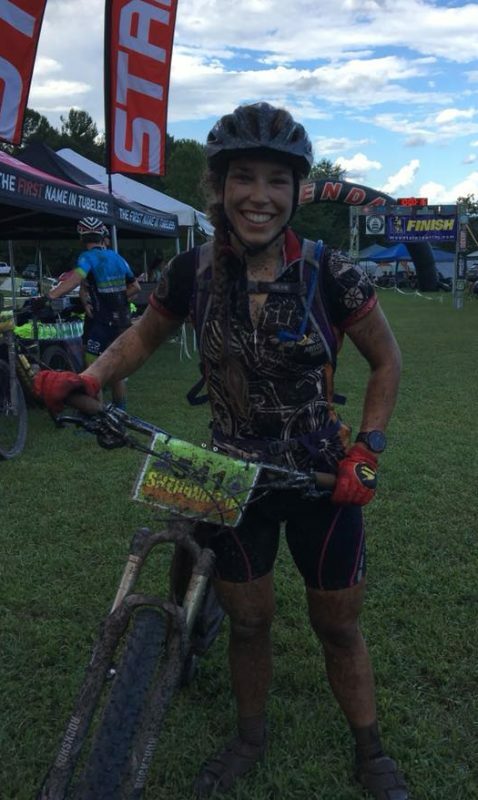 Taking the third spot on the podium was, Bryna Blanchard of BMB Racing finishing at 4:52:33. 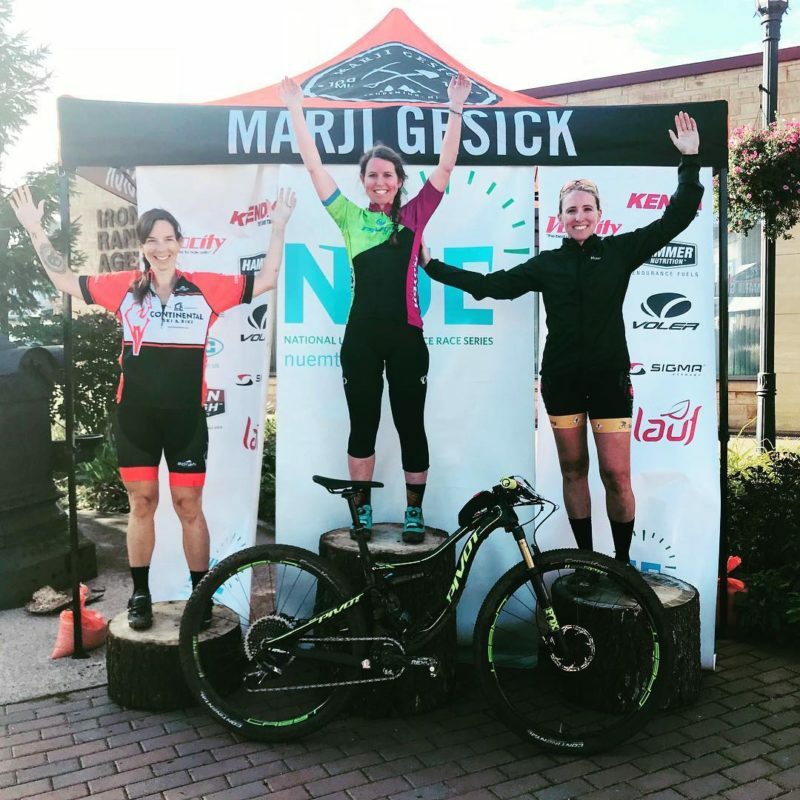 Blanchard finishes second in the 2018 NUE women’s Marathon series with a win at Wilderness, second at Iron Mountain, second at Mohican and a third at Big Bear. 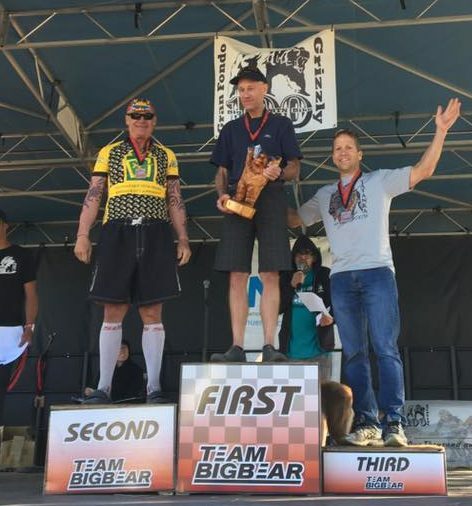 Taking the top step in the Master’s division was, Greg Golet of Team Chico, with a time of 3:54:10. 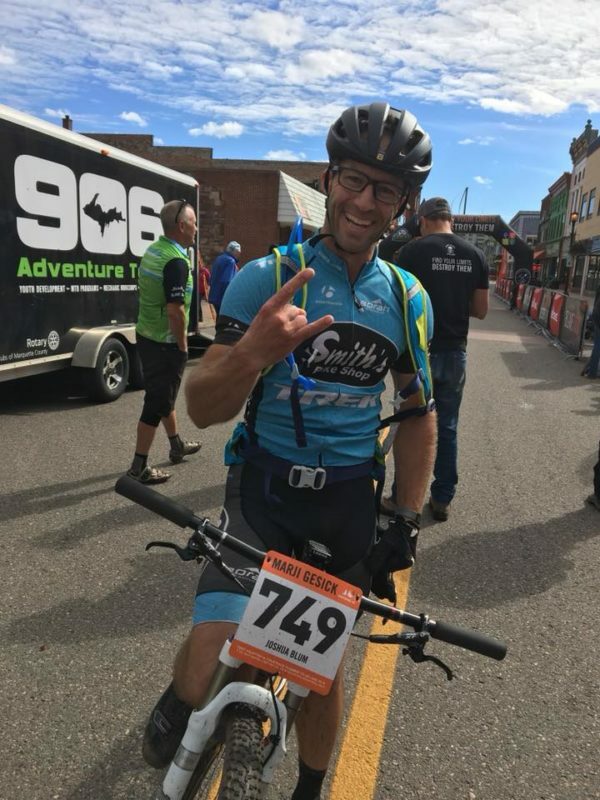 With this placing, Golet takes second in the overall 2018 NUE Marathon series. Finishing a couple minutes back with a time of 3:56:21 was Mike Dailey. 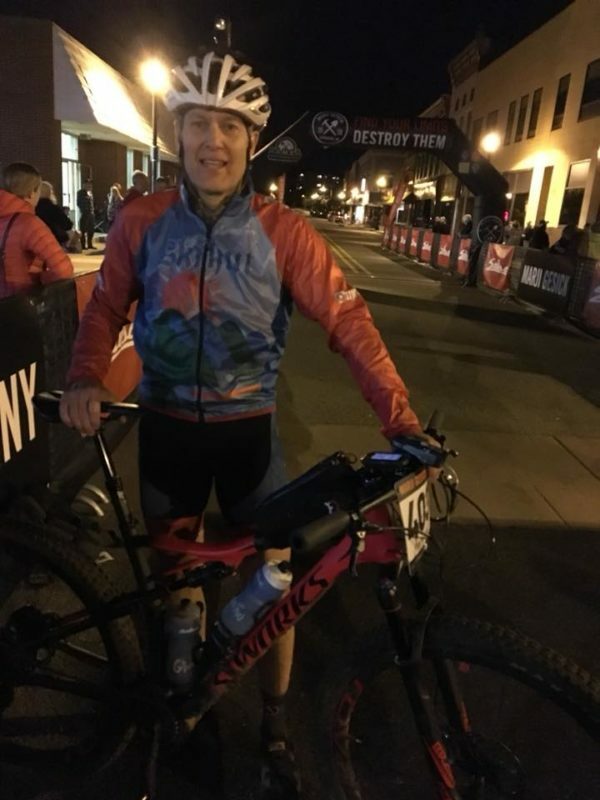 Dailey finishes the season strong and takes sixth in the 2018 Master’s Marathon series. Claiming third was, Jeff Peterson, crossing the line at 5:40:16. 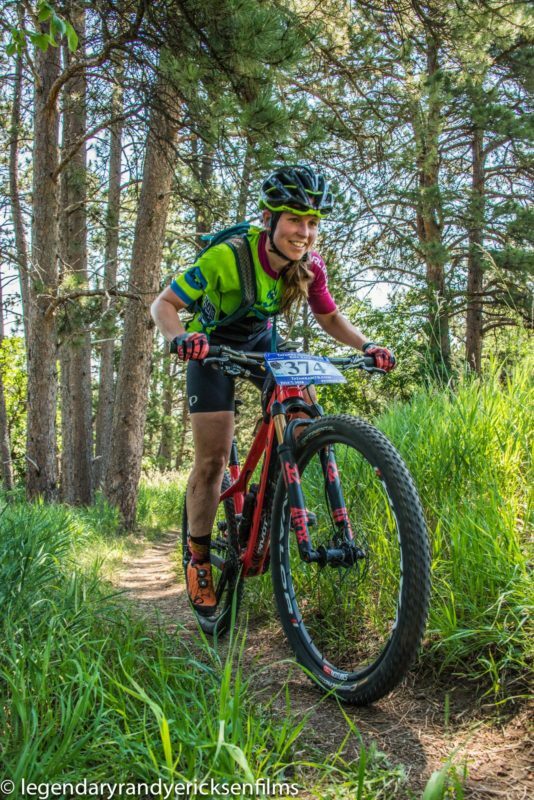 Taking the win in the singlespeed division was, Shannon Boffeli, Pearl Izumi/Pivot Cycles MTB, with a time of 4:15:05. 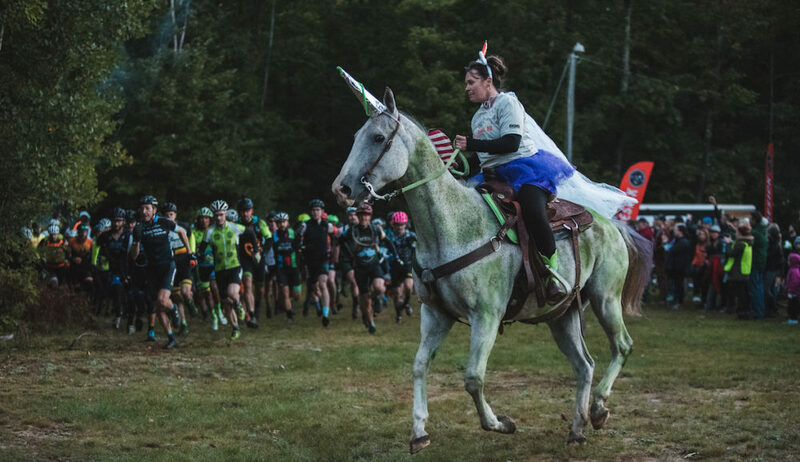 The Shenandoah 100 achieved a major milestone in the history of endurance racing celebrating its 20th Anniversary as the oldest race in the NUE Epic Race Series. 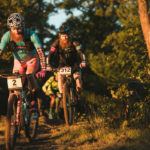 Held within The George Washington National Forest of Virginia, Shenandoah marks the start of the fall season of the NUE Series with just two races remaining that will determine this year’s champions. 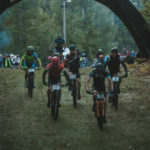 Shenandoah is a highly anticipated showdown showcasing top level talent in a festive atmosphere with most racers choosing to camp out at the Stokesville Lodge and campground. This year, rain leading up to race day made course conditions slick and treacherous at times although race day weather was warm and mostly sunny. Hamm posts a sub 10 for the win! 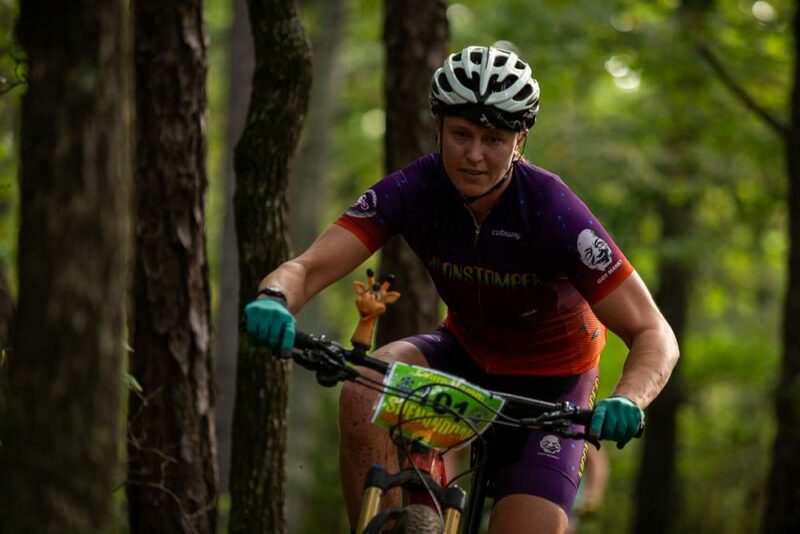 Following third place finishes in both 2016 and 2017, Laura Hamm, Moonstomper/Blacksburg Janglers, stepped up to the top of the podium with a winning time of 9:35:36. 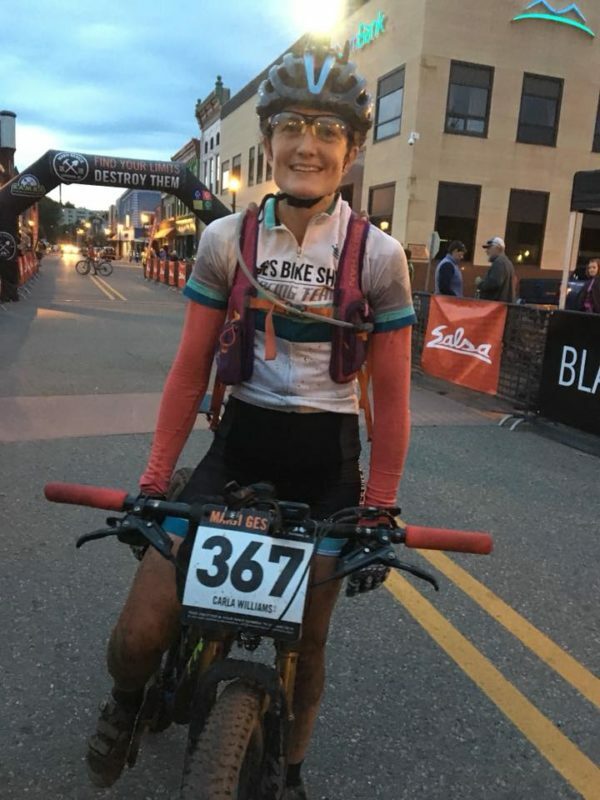 Shenandoah was Hamm’s first NUE win although she also posted a third place finish in the NUE Marathon Series at Iron Mountain 100 earlier this season. 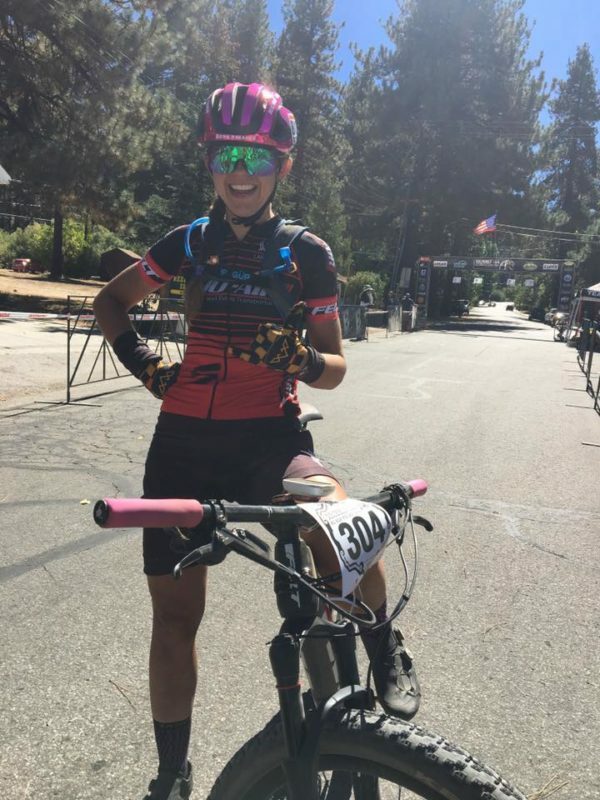 “Going into the race, my main strategy was to hang on to Lauren Cantwell’s wheel until I could no longer keep pace (likely around mile 20). I executed this plan expertly until mile 4, when Lauren’s sidewall was sliced by something mysterious, likely a trail gnome. 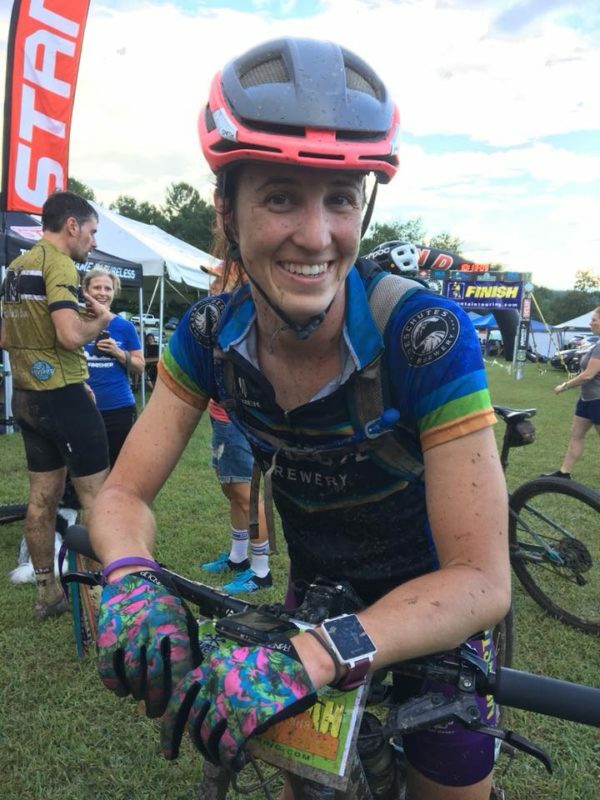 Following a third place finish at the NUE Series Wilderness 101, Amelia Capuano, Reardon Steel Fab, finished 10:00:02, taking second at Shenandoah. “I had a fun day and started off quickly, trying to stay towards the front. I settled in on the chill climb up Lynn trail and it was mostly steady going from there. I really loved the nice rip down Chestnut and lack of brakes to go with it after slopping through some WV-esque mud holes. Thanks to whoever made me eat a Sammy and chug some coke at aid 6!! 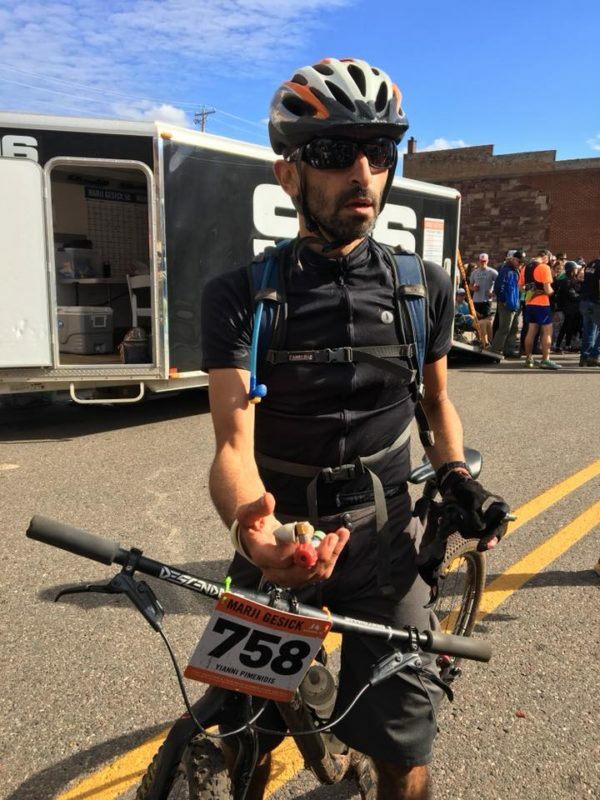 Really, thanks to all the folks at aid stations – so helpful with chain lube, grabbing food, and making me laugh! I love these races and Chris Scott knows what is up!! 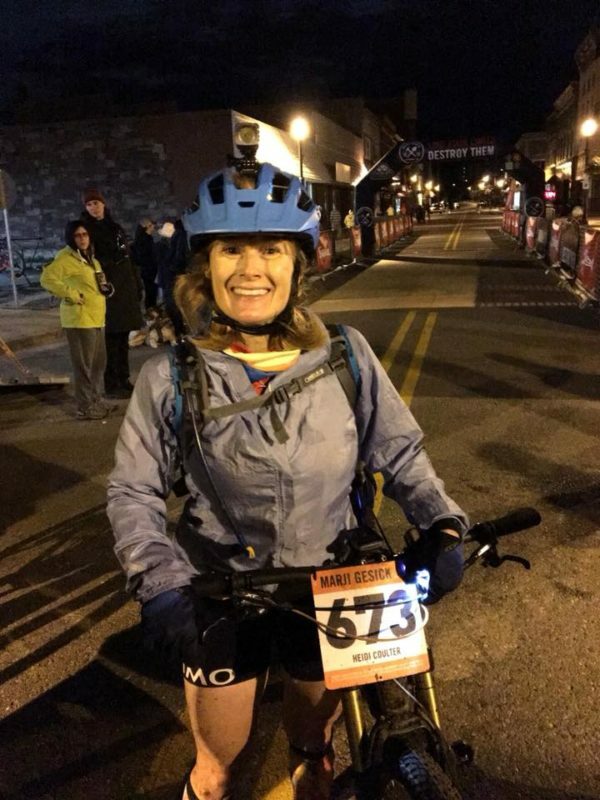 Also, shout out to the legend, Cheryl Sornson, (former NUE Series Champion) for helping me learn the ropes of 100-mile racing. Twelve minutes later, Lauren Cantwell, Deschutes Brewing/Stokesville Lodge, claimed third at 10:12:30. Cantwell is now ranked second with 10 points in the NUE Series behind series leader, Larissa Conners. In addition to her first win at Cohutta this spring, Cantwell also posted a second place finish at Wilderness 101 plus fourth at Pierre’s Hole 100 in Wyoming and fifth at the NUE Season Opener at True Grit in St. George Utah. Anderson goes sub Seven to get his first ever win at Shenandoah! 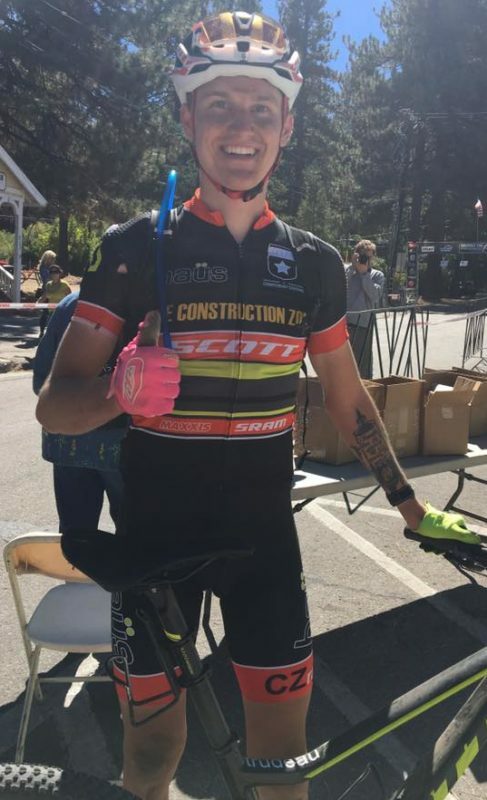 Newcomer, Eddie Anderson, Hagens Berman Axeon, surprised many taking first at 6:57:14 in a stacked field that included former and current NUE Series Champions. 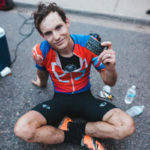 Coming off his first NUE win at Mohican in June, Two-time NUE Series Champion and Shenandoah course record holder, Jeremiah Bishop, Canyon Factory Racing, came in at 7:14:03 to claim second. “I would call it an off day. I can do some amazing things sometimes but I struggled to find my rhythm today. 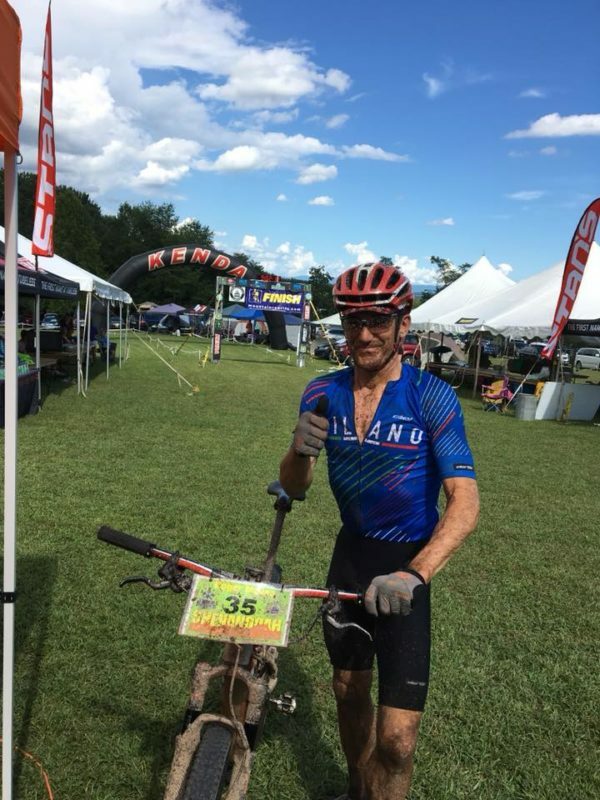 I felt lucky to pull myself back together and hold of Dylan for second.” 2017 Shenandoah race winner, Bishop, finished second overall in the NUE Series Men’s Open in 2017 and posted a ninth place finish at Wilderness 101this season. Eight minutes later, NUE Series Defending Champion, Dylan Johnson, Leska MTB, finished third at 7:22:46. Johnson leads the NUE Series with 6 points that include wins at the Cohutta 100 in Tennessee, Lumberjack 100 in Michigan and Wilderness 101 in Pennsylvania plus a third place finish at Tatanka in South Dakota. Johnson finished fifth last year and second in 2016 behind Jeremiah Bishop at Shenandoah. 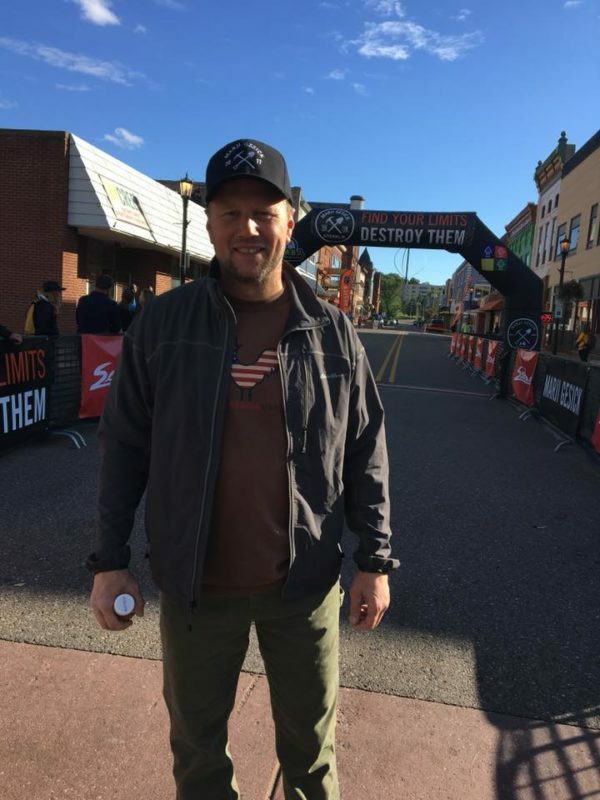 David Flaten, Otterhaus Racing/Coaching, was fourth at 7:41:08 with former NUE Series Champion, Keck Baker, Blue Ridge Cyclery Racing p/b Reynolds GM/Subaru, just two minutes back at 7:43:40 finished fifth. 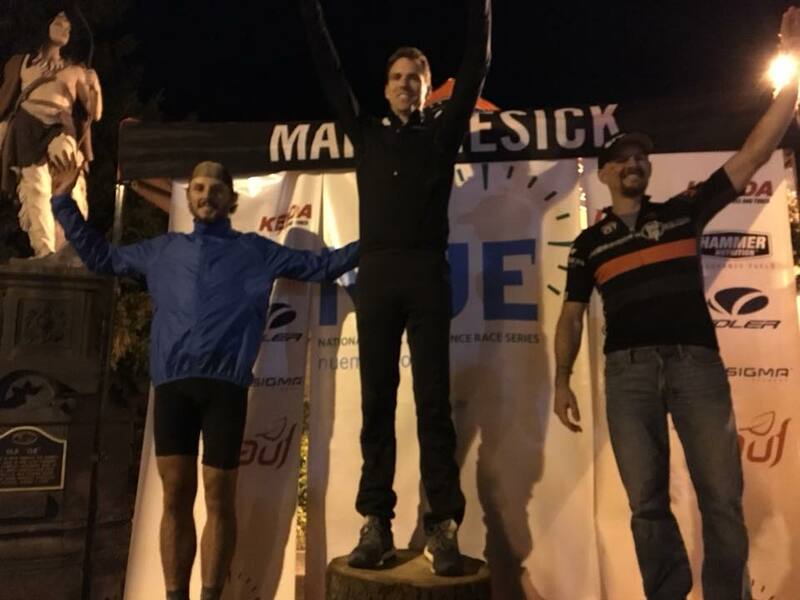 2016 Shenandoah race winner and former NUE Series Champion, Christian Tanguy, RBS Cycling Team, was sixth in the Men’s Open at 7:45:46, just one second behind SS winner, Gordon Wadsworth. 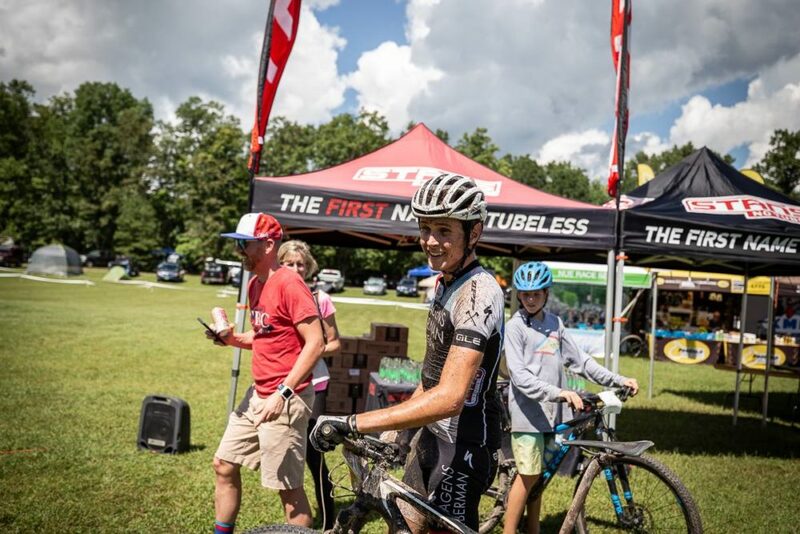 Tanguy is currently ranked second in the NUE Epic Series with a score of 11 that includes a second place finish at Cohutta plus third place finishes at Mohican, Lumberjack, and Wilderness 101. In 2017, Tanguy place second behind Jeremiah Bishop at Shenandoah. 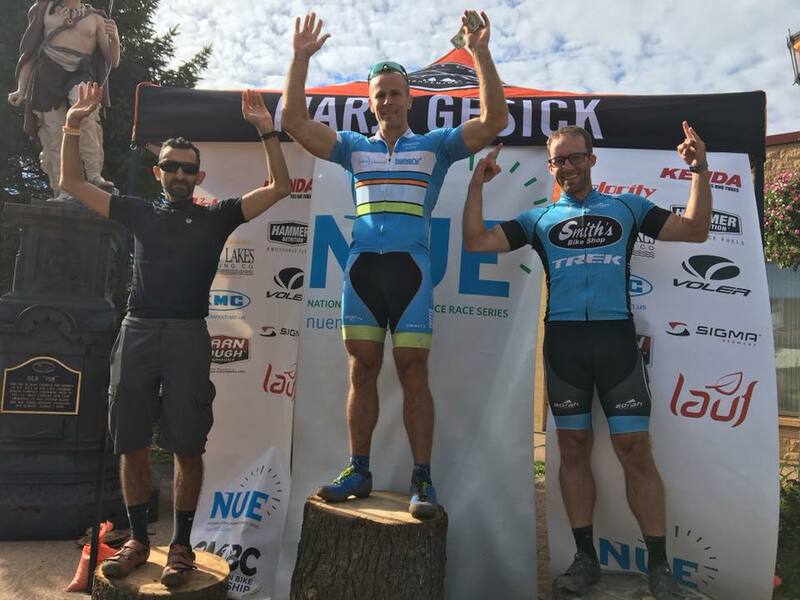 Defending NUE Series Singlespeed Champion and 2017 Shenandoah SS race winner, Gordon Wadsworth, Blue Ridge Cyclery/Pivot Cycles/Industry Nine, took the win at 7:45:45, including placing sixth overall! 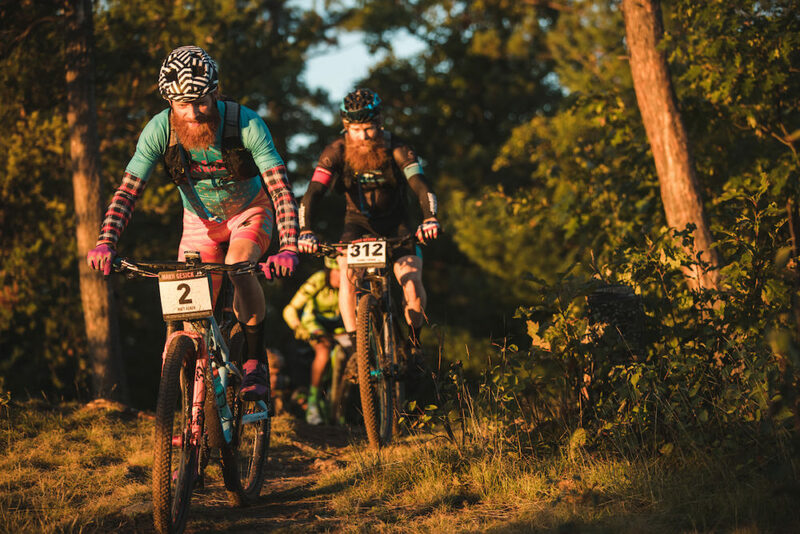 For 2018, the Defending NUE Series Champion now has three wins with wins at both True Grit Epic and Wilderness 101 this season. “My SM went really well. The conditions were about average for VA in hurricane season, slick and snotty, with periods of good hot sunshine. The past two years at SM have been record breaking conditions and so it was nice to see a classic VA race shaping up. As always, I knew my mission was get into a fast group and STAY there! A lot of flats early in the game on a bonier than average Narrowback trail precipitated a chase group early. The rain made the normally rocky but manageable Narrowback/Tillman trails full on carnage of riders with mechanicals and flat tires. My K2N Stage Race teammate Thomas Turner and I bottomed out on Tillman Rd to see Chris Michaels in the distance. We chased up to Chris and as a group got the lead quad in our sights; nearly joining them before Lynn trail. On Lynn, we each rode our own paces (mine with a dash of walking) as we bridged up to Keck Baker. Now four riders strong, this group rode well together until Baker attacked on Hankey Mtn. We dropped Chris Michaels and eventually bridged up to a flagging Christian Tanguy. Thomas and then we set out towards the Death Climb. On the approach into the climb, we were joined by our friend David Flaten. I asked Flaten if he had seen the always strong John Haddock recently and he replied that he had not. Flaten added a component of motivation to the mix and he and Baker attacked not long into the steepest part of the climb; separating Thomas and I from them and Christian farther off still. Thomas and I rode together in our good old duo mix until nearly the top of the death climb up Reddish Knob. Near the top my SS pace dictated a little harder effort and I was sure he would join me on the Chestnut DH. A rider did but it wasn’t Thomas, it was Christian Tanguy. Christian and I have pedaled a few miles together over the years and I was glad for someone to share the line down a really grade A descent! Christian and I bottomed out together and then leapt out of aid 6 headed for the final ascent up Hankey Mtn. On Hankey we climbed well together with Christian even offering to let me roll ahead. I had no interest in that as, at this point, I felt pretty comfortable in my lead. I got a little distance on Christian and then POW my chain derailed from my Pivot LES Singlespeed. Really unusual, but a chain stretched from 90 miles of VA steeps and gritty trail conditions made the unusual possible. As Christian passed I resigned myself to 7th overall. I re-set the chain and jumped aboard. However, near the top of the Hankey climb, I saw Christian again and passed him just as we headed into the singletrack. I got a little more distance on him but, as we bottomed out on the gravel before the campground singletrack, I again heard Christian. He was clearly gunning for another position on the results sheet. He dove into the singletrack just ahead of me, doing a little blocking and, no doubt, aware of the charging that could happen at any moment. I let Christian lead all the way to the line before a hard corner and a half-hearted bike throw landed me that sixth position. 2016 SS Race Winner, John Haddock, J.A. King, finished second at 8:32:18, utilizing 34/19 Gearing. 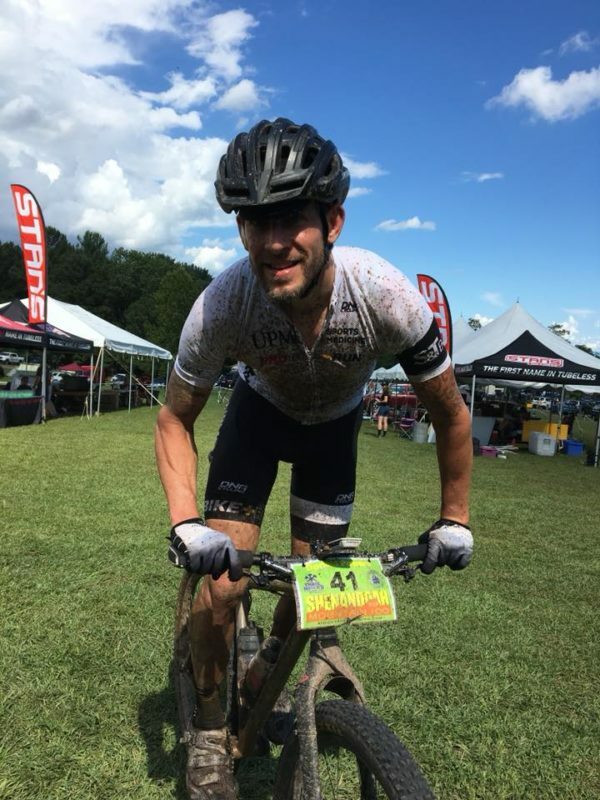 Haddock currently leads the NUE SS Epic Series with wins at Cohutta and Mohican plus a second place finish at True Grit Epic. 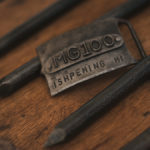 “As always, the much anticipated Shenandoah 100 was a blast this year. Conditions were tough, but that made finishing all the more rewarding. 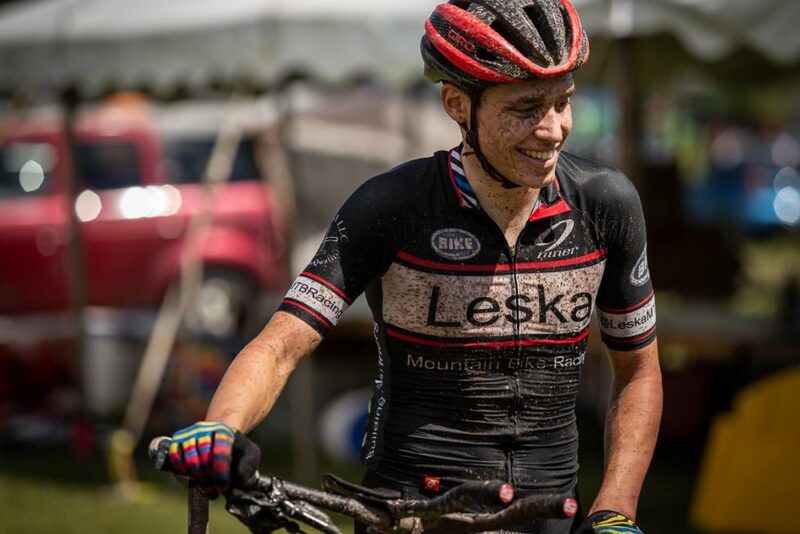 This would be the 4th race of the series for me and with school back in full swing, my plan was to ride my own race, hope for a good finish, and stay healthy. I got off to a good start and exited Narrowback with a group, but unfortunately they got away on Lynn as I went for an extended hike. Seven minutes later, Don Powers, UPMC Pro Bikes, took third at 8:39:13. Powers finished second at Mohican and third at Wilderness 101 this season. 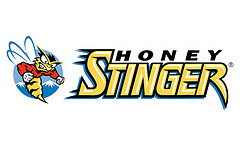 Powers also finished third at Shenandoah in 2017. Bradley Cobb, Motor Mile Racing/SCV, was first in the Masters at 8:36:46. 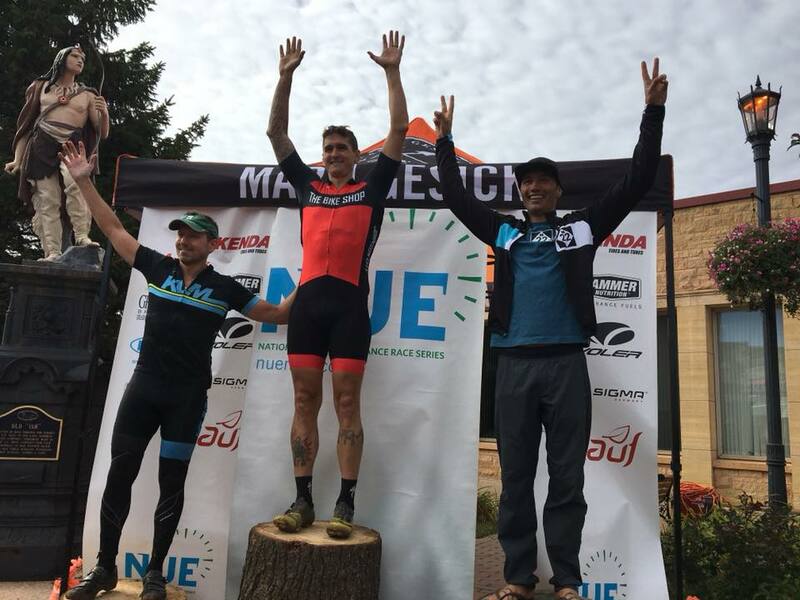 Cobb is currently ranked second in the NUE Epic Masters Series, behind Carey Smith, with a score of 8 that includes his win at Cohutta plus a second place finish at Lumberjack and fourth place finish at True Grit Epic. 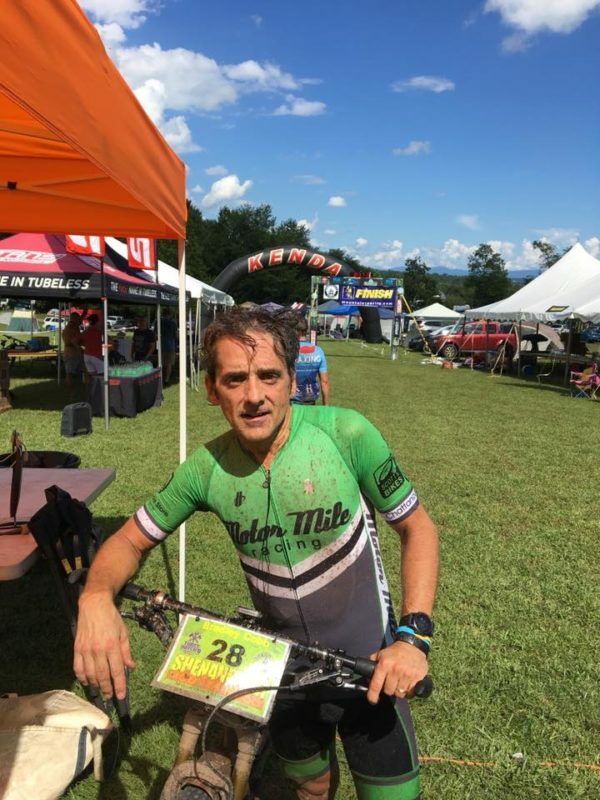 Former NUE Series Masters Champion, Roger Masse, Stokesville/Shenandoah Mountain Touring, took second at 9:01:51. 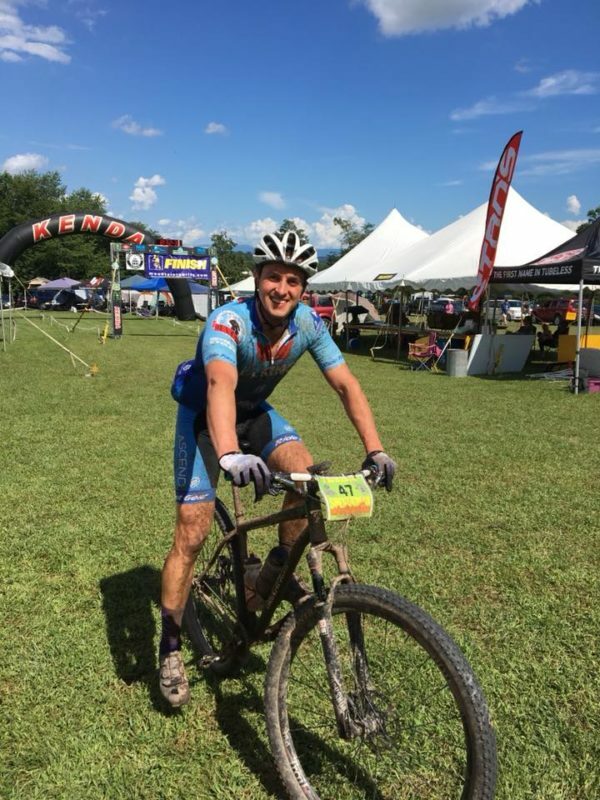 Masse is currently ranked fourth in the NUE Epic Masters Series with a score of 11 including his second place finish at Cohutta, fourth place at Mohican and third at Wilderness 101. 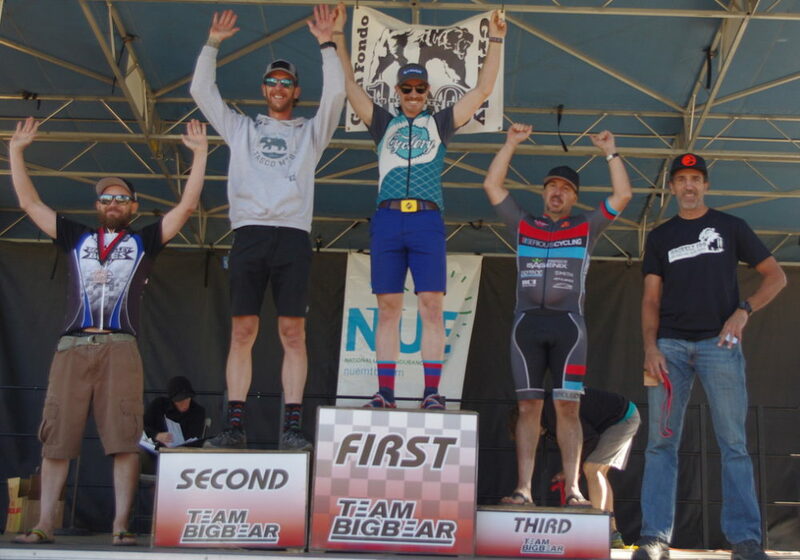 In his first NUE Series race this season, Jed Prentice, Team Bike Doctor, took third at 9:27:51. 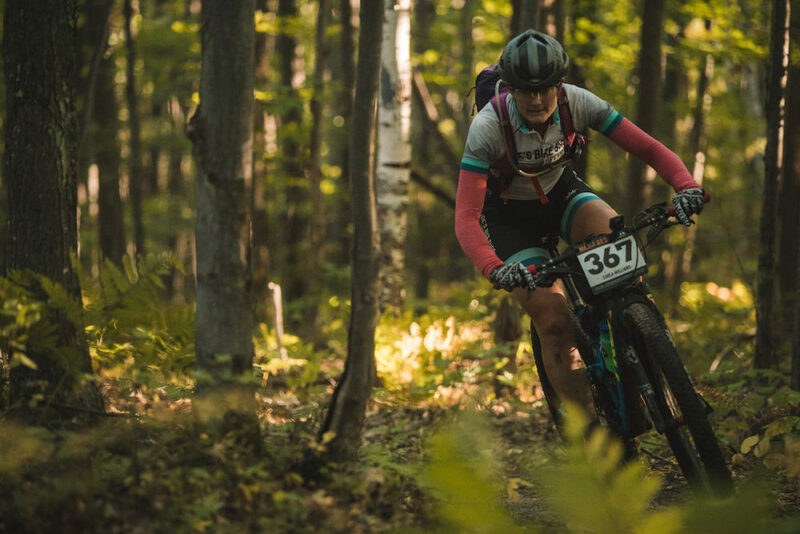 On September 22, the NUE Epic Series heads to the Upper Peninsula of Michigan for the Marji Gesick, one of the most difficult courses in the NUE Series. 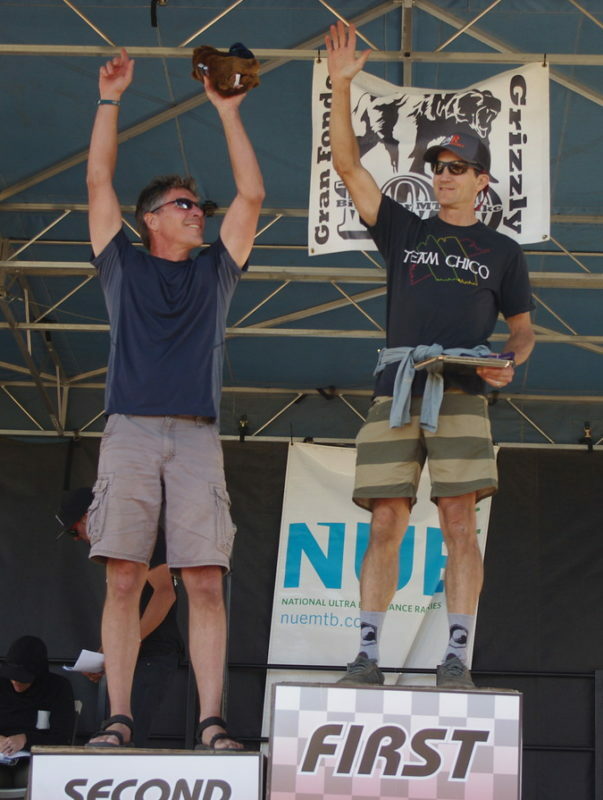 From Michigan, The NUE Championship race at the Grizzly 100 in Big Bear, CA is slated for September 29, 2018. 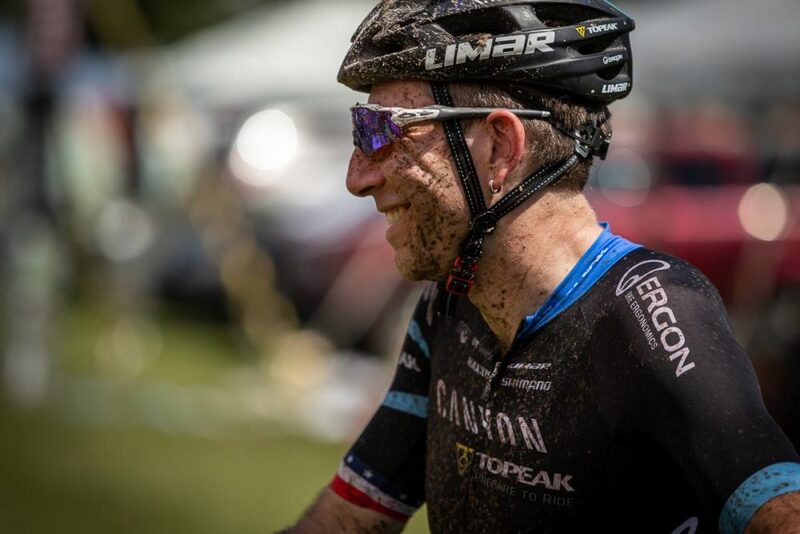 All four Division winners will receive complimentary entry into all NUE Series races in 2019, Custom Voler Champion Jersey Kits, plus a share of the $10,000 NUE Series cash purse. 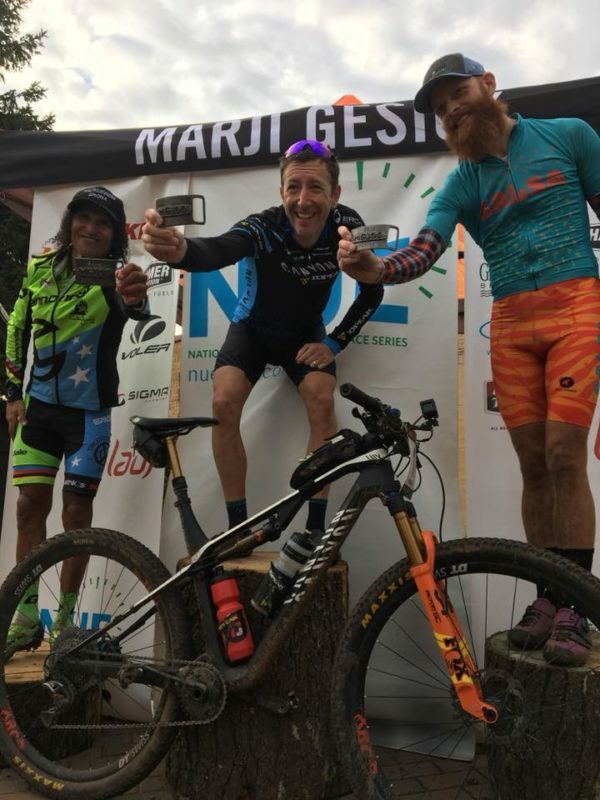 As an added travel bonus, NUE division winners are invited to represent the NUE Series at The LaRuta de los Conquistadores, a three day stage race across Costa Rica November 1-3, 2018. There is still time to register for anyone that would like to join NUE Champions on this incredible journey from the Pacific to the Caribbean. 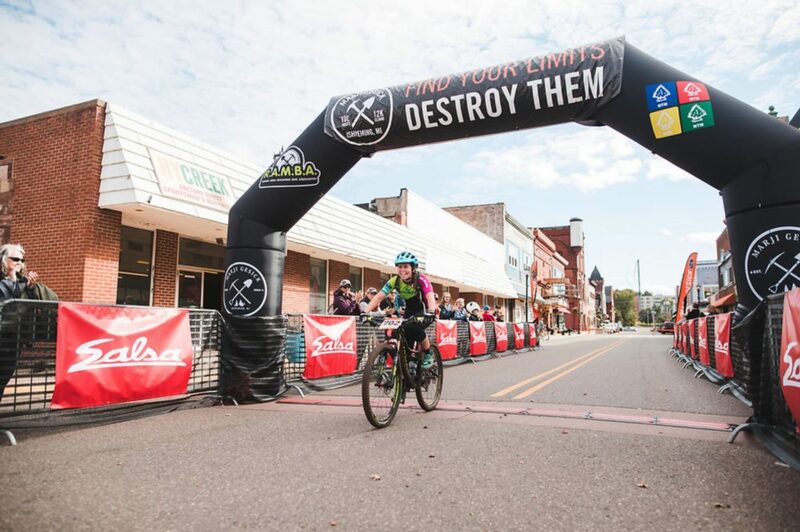 ALL NUE Series finishers who do not qualify for prize money will receive prize packages courtesy of NUE Sponsors Kenda Tire, Hammer Nutrition, Sigma Sport, KMC Chain and Darn Tough Socks. 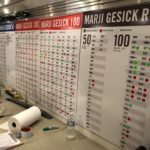 Stay tuned here for the latest news and information on the Marji Gesick and NUE Series Championship Race!